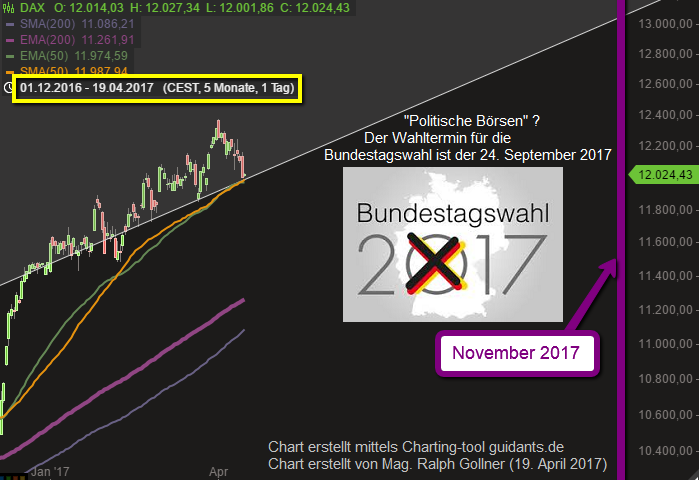 Von 120 Aktien in diesen drei Indizes haben den Handelstag nur 7 Notierungen im Minus geschlossen! 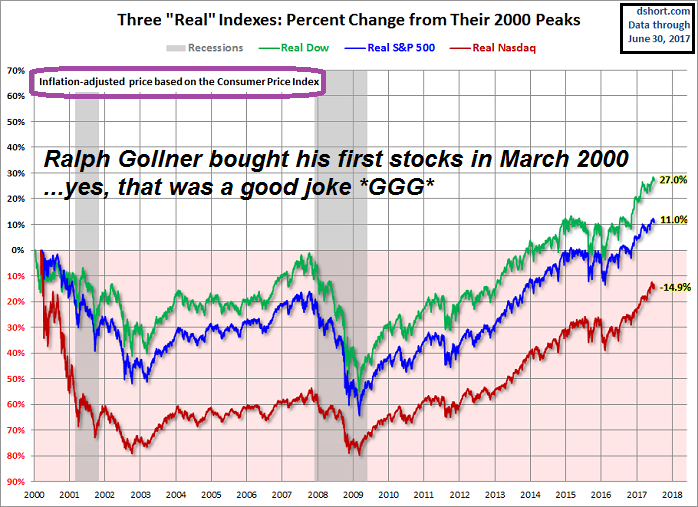 The media is so crazy about he rich Stocks-investors getting richer. 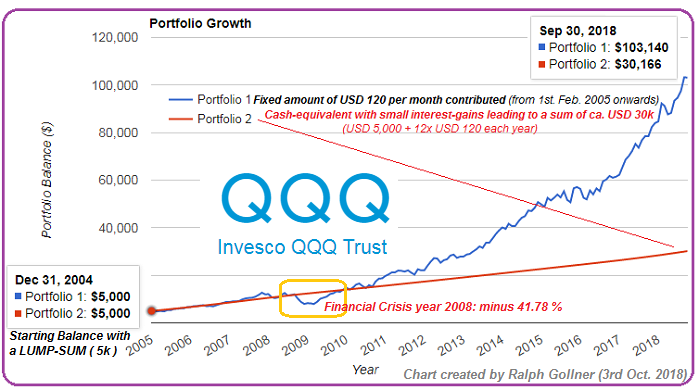 From the year 2000 until 2013 mostly the Broker were becoming richer by collecting transactions fees from nervous investors. 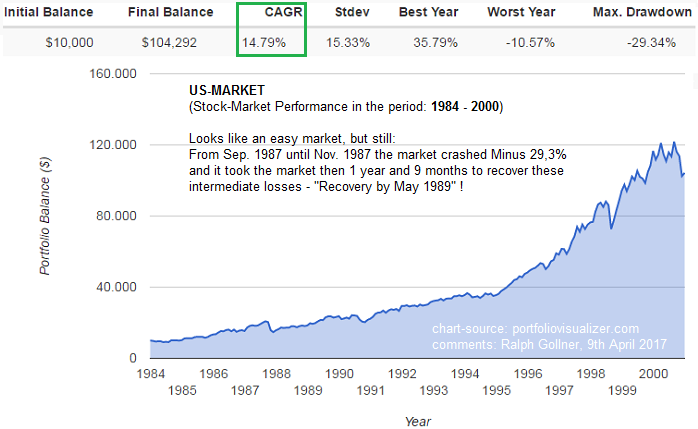 Therfore one should never forget >> "Investing is easy, but not simple." 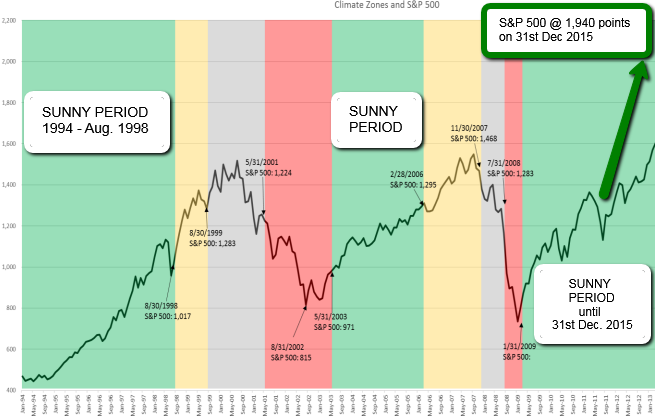 Especially not in the era: 2000 until the summer of 2013..., BUT well: the period of Summer 2009 until 2013 already produced great returns (again). 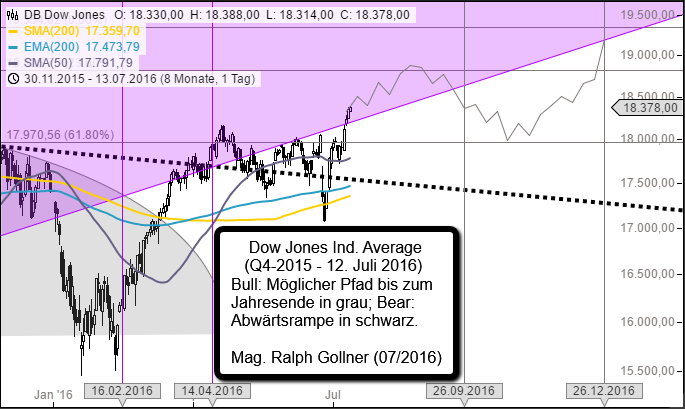 20 Dow Jones-Werte mit Top-12Monats-Performance ! 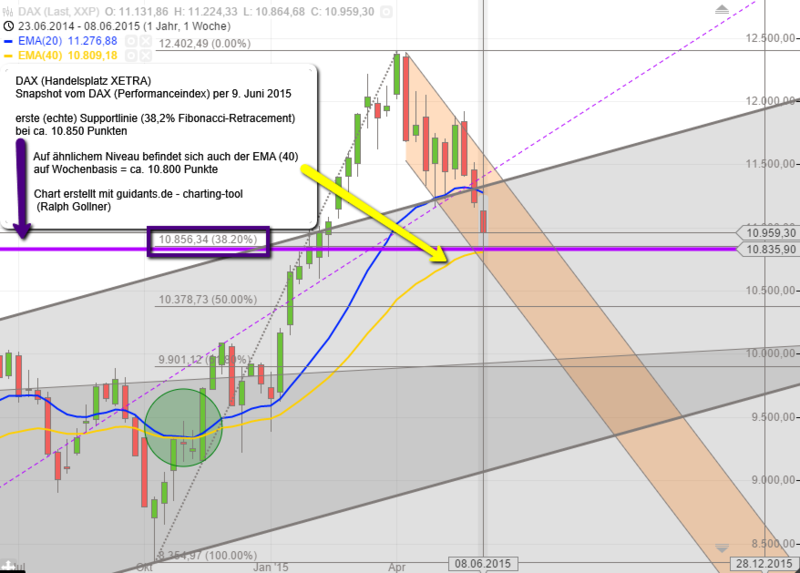 Recheck the EMAs I applied in the chart above. They could serve as support levels in the upcoming quarters - if needed. We will have to wait and see. 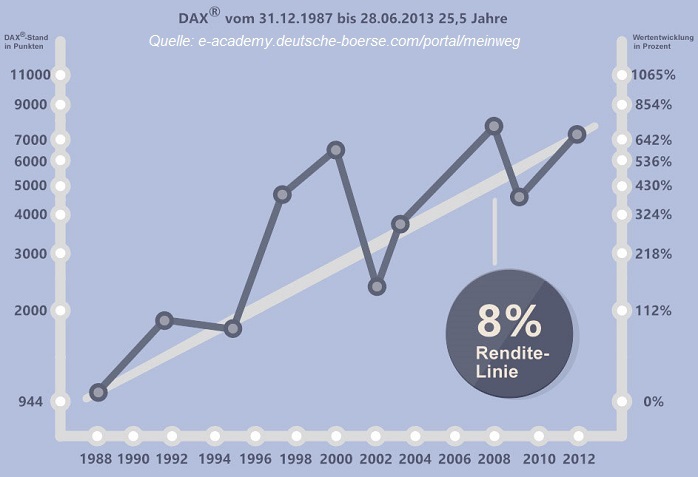 For the moment/what is left to say: "THE TREND IS OUR FRIEND"
...sogenannten "Internet Commerce, bzw. e-Commerce". 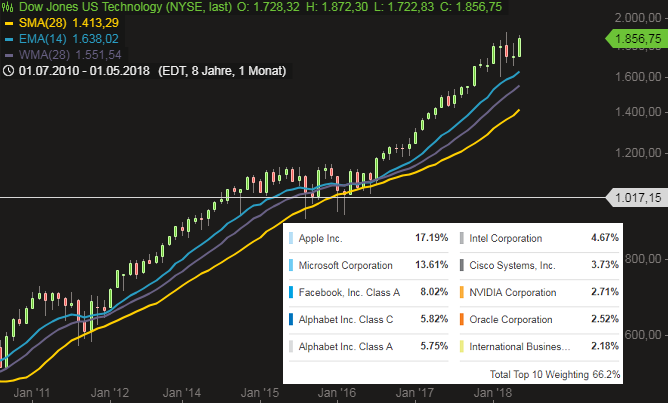 The Dow Jones Technology Sector tracks a market-cap weighted index of U.S. technology companies. The Index is mainly driven by digital trends like: Internet of things, Internet Infrastructure, Chips (not to eat), Tech-R&D, etc. 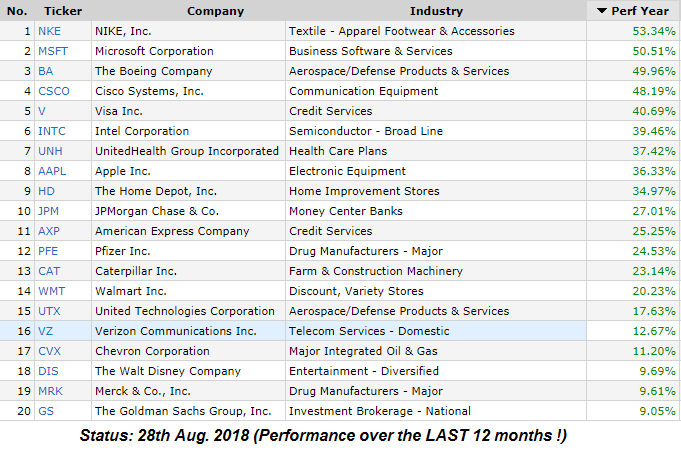 Disclosure/Disclaimer: Ralph Gollner hereby discloses that he directly owns securities of some of the stocks mentioned above: Apple (AAPL), Microsoft (MSFT), FB (Facebook), Google/Alphabet (GOOGL), Intel (INTC), Cisco (CSCO) and Nvidia (NVDA) as per 1st June 2018. ...Minus - im 3 Jahres-Vergleich wohlgemerkt! 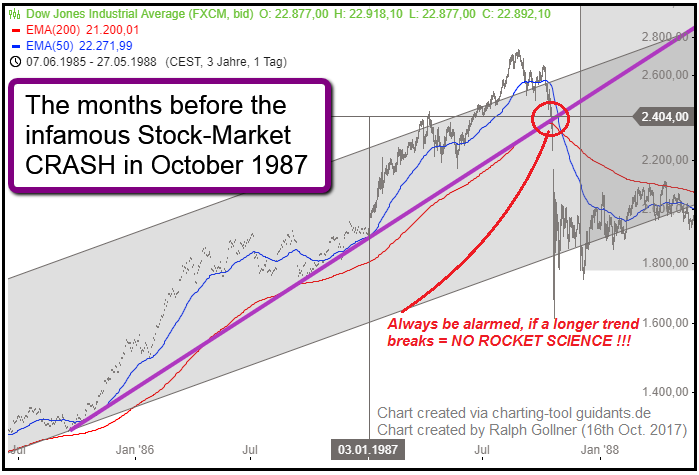 ...1982 as the start of the last secular long-term bull market. 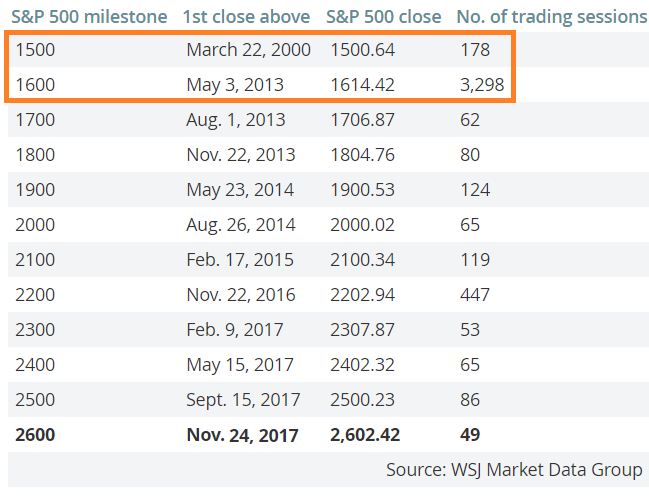 And it is also how one gets to March 2013 as the start date of this bull market, when the S&P 500 topped the earlier high of 1,565 set in October 2007. 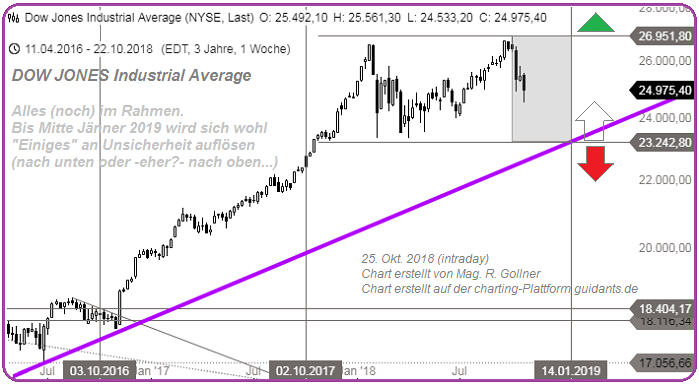 "3 Standard Deviations above/below the SMA200-daily"
...nicht irgendein beliebiger Wert auf einer nach oben offenen Skala wie beispielsweise bei Aktienindizes! Der Anleihen-Index folgt anderen Regeln: Der Bund-Future drückt aus, wieviel eine zehnjährige Bundesanleihe mit einer Verzinsung von 6 % im Durchschnitt kostet. ...other central banks reducing quantitative easing policies of buying sovereign debt to repress rates. ...amount (for example, USD 1,000) invested in them. 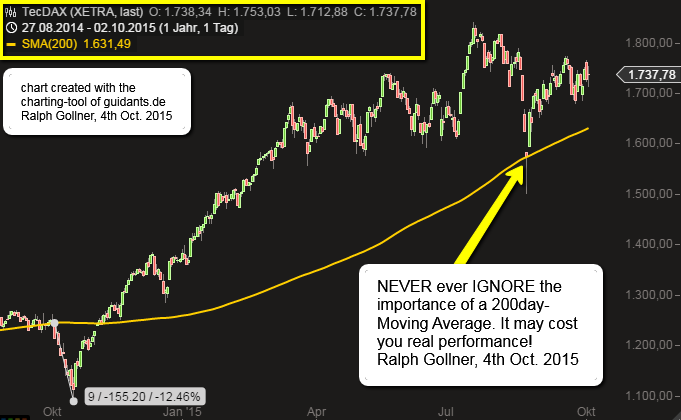 The daily average move of this index is calculated geometrically (rather than arithmetically). ...Arab Light. Entscheidende Qualitätsmaßstäbe sind die Dichte (gemessen in API-Grad) und der Schwefelgehalt des Rohöls. 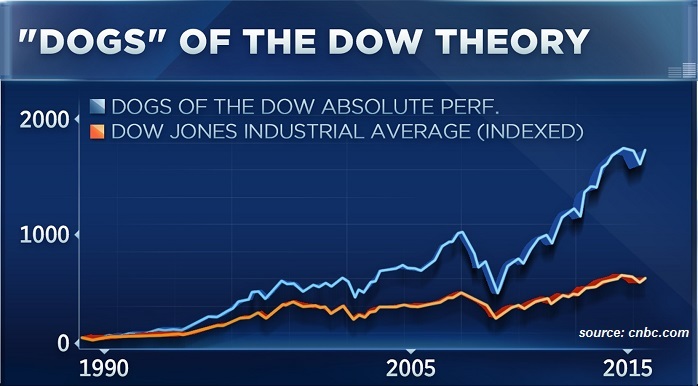 Developed more than 115 years ago, "Dow Theory" - created in part by Charles Dow, the founder of the Wall Street Journal - is considered the oldest stock market indicator that's still followed by a broad swath of the investing public. 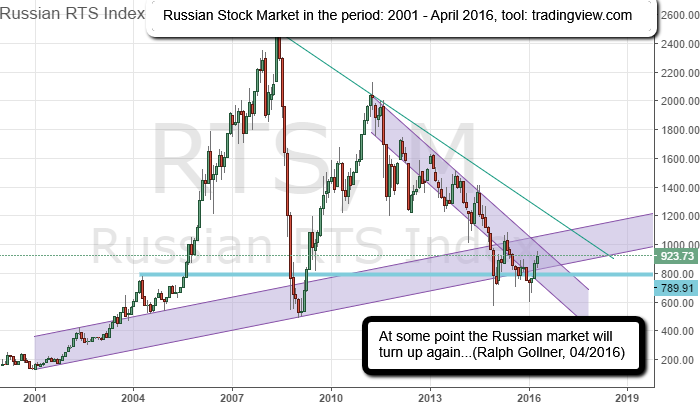 It warned of trouble in late 1999, for instance, a few months before the dot-com crash in March 2000. 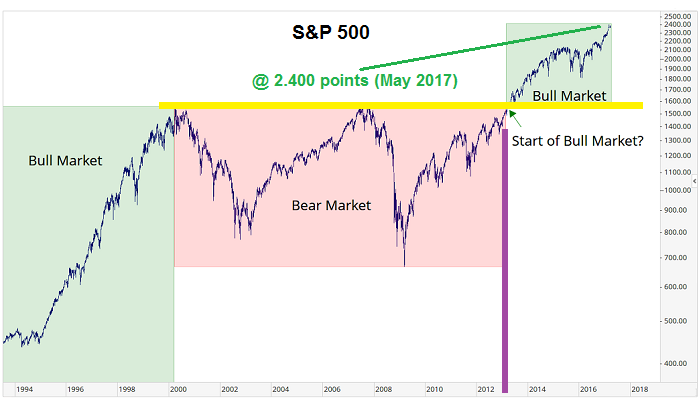 And it sent a buy signal in April 2009, almost exactly at the start of the current eight-year-old bull market (DJT - weekly updated = Dow Jones Transportation Average - Index). 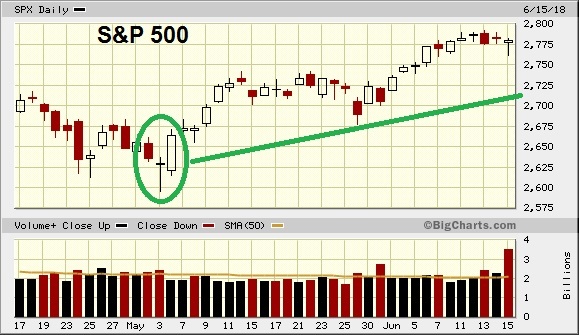 ...by far the largest single-day decline in its history. 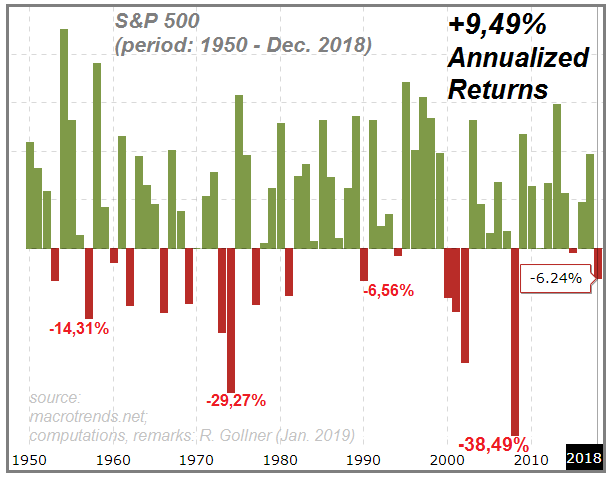 Based on current values, that's equivalent to losing just more than 5,000 Dow points in a single day. 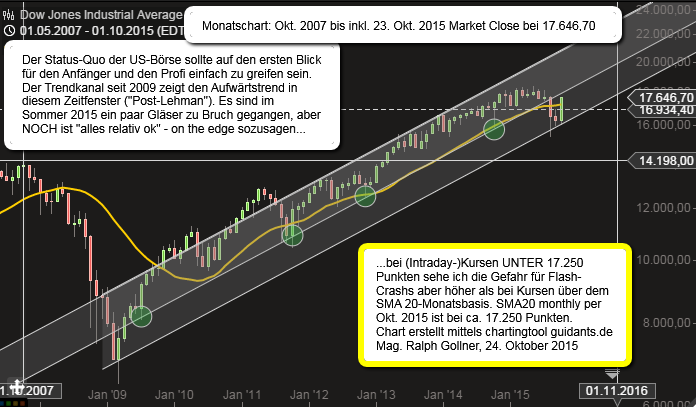 (But) Black Monday still offers lessons. 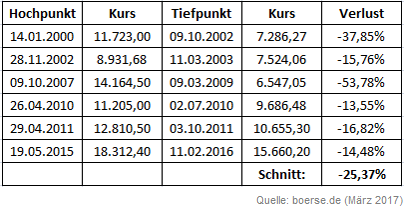 Zur Info: Im Schaubild habe ich den Start für alle Zeitreihen im Jahr 2007 auf 100 vereinheitlicht - zwecks einfacher Vergleichbarkeit. 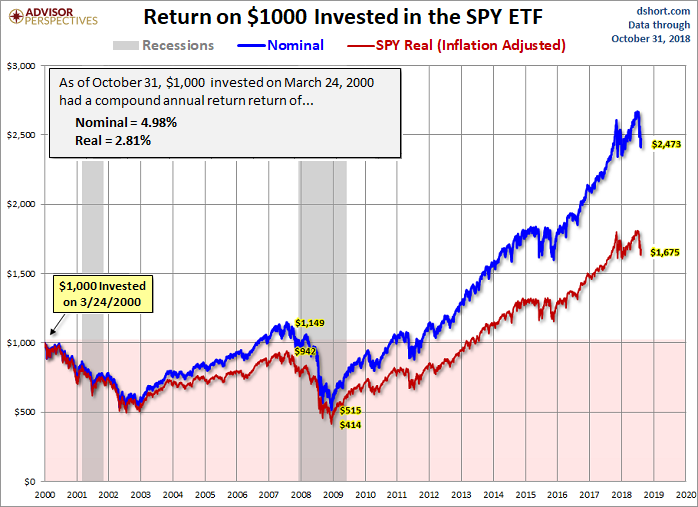 Stocks can fall faster and further than junk bonds, but they also offer the possibility of significant capital appreciation in the long term - here a comparison between the broad US-Stock Market & HY-Bonds (S&P 500 vs. Corp. High Yield Fund / "HY-Bonds"). 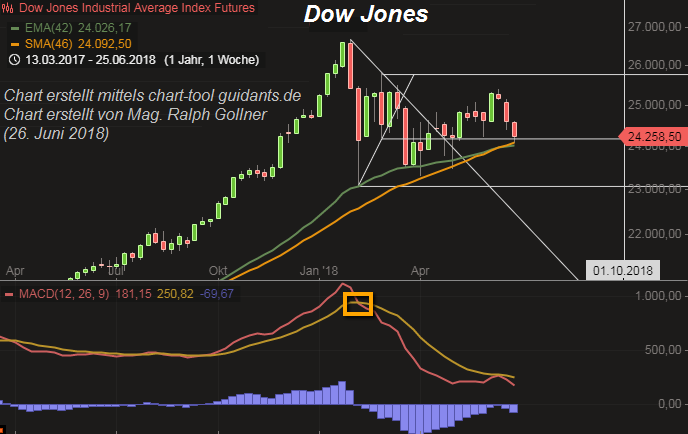 Over the previous two weeks the Dow Industrials has been diverging from most other Indices and particularly the Dow Transports. 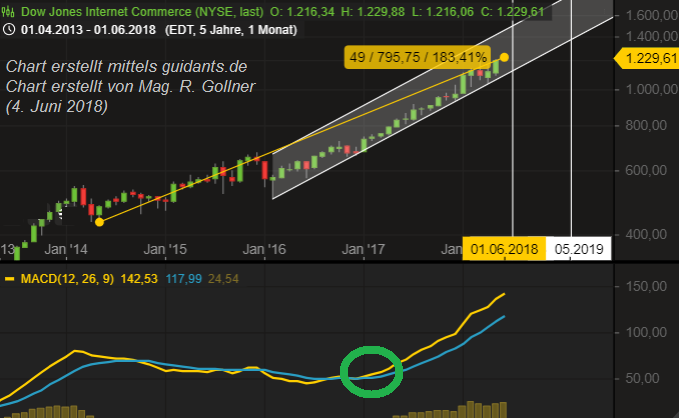 An important part of the divergence has been the relative narrowness of the rally in the Dow. ... expectations. The chart-curves above are based on price only. Dividends were NOT included! 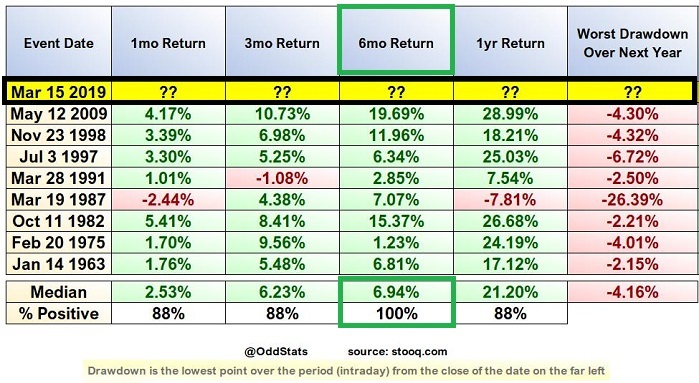 So, there was some relief for Dividend-stock-investors over the period displayed (these dividend-income streams are not included and not displayed in the performance-curves above)! The "EM-Index" captures large and mid cap representation across 24 Emerging Markets (EM) countries*. With 845 constituents (as per July 2017), the index covers approximately 85% of the free float-adjusted market capitalization in each country. *EM countries include (as per July 2017): Brazil, Chile, China, Colombia, Czech Republic, Egypt, Greece, Hungary, India, Indonesia, Korea, Malaysia, Mexico, Pakistan, Peru, Philippines, Poland, Russia, Qatar, South Africa, Taiwan, Thailand, Turkey and United Arab Emirates. 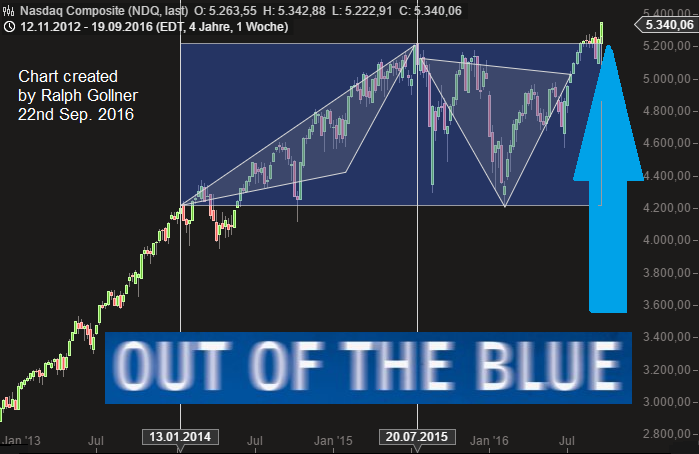 ...of tops and bottoms in the broad equity market. 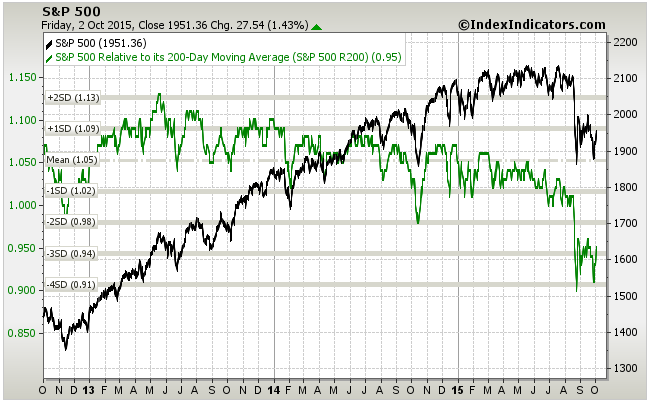 And, by virtue of hitting an all-time high last week, it is suggesting that the market still has further to rise. 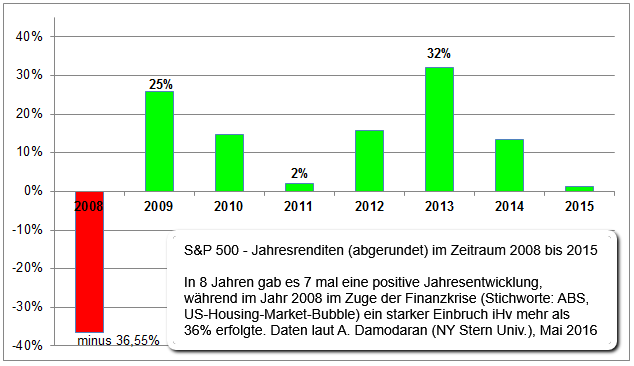 Sill, the S&P 500 relies highly on the domestic economy (being the United States). But recheck the IT-Sector, but also the companies from the Industrial Sector, which have a relevant portion of their sales abroad. 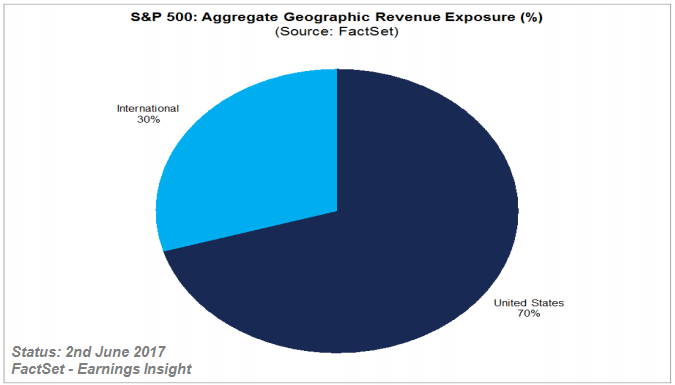 The ongoing global recovery is especially poignant for the IT sector, as it derives a larger percentage of its revenue from international sources than any other sector (see following Figure). 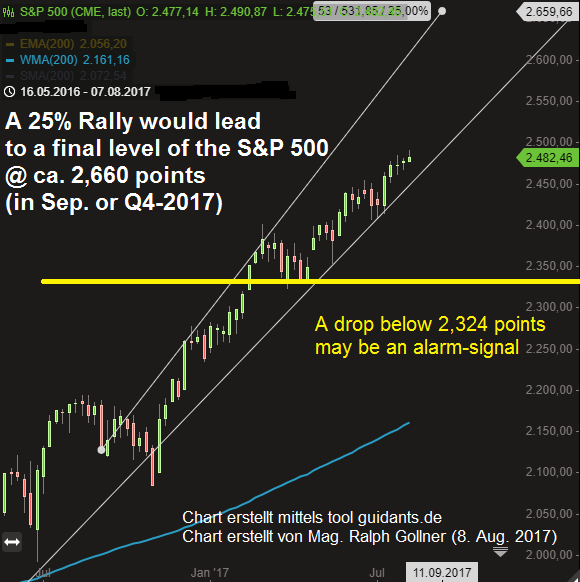 US-Markets had their final hooray in the tailwind-environment of Mr. Trump (election-month November 2016). 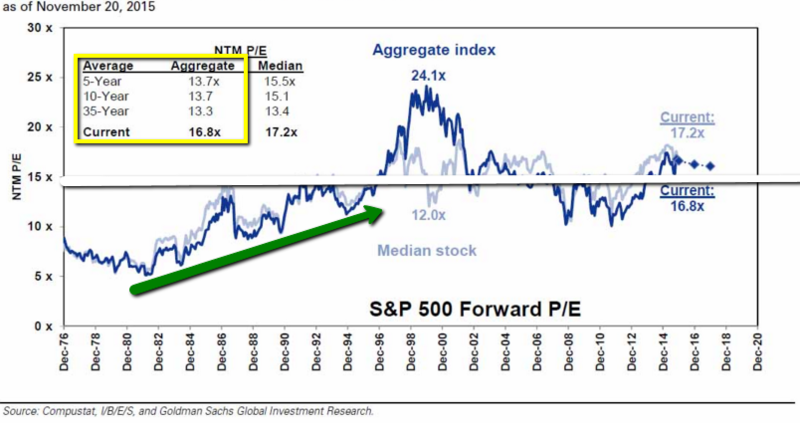 Maybe it's time for the Rest of the world to start their Stock-Market Gains? 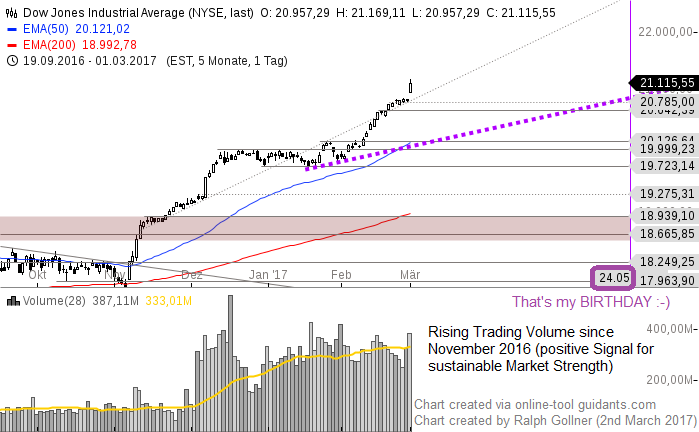 sustainable Gains? 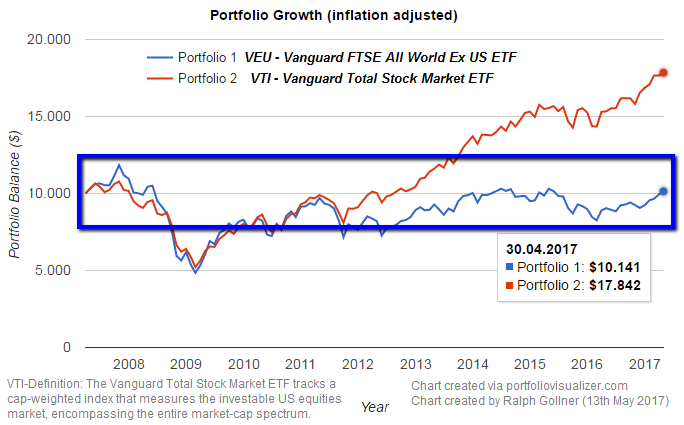 Well, I used the two different ETFs "VEU and VTI" to show the different development -before the crisis in 2008- and through the period 2009 until April 2017. Especially, please focus on my parameter used: INFLATION ADJUSTED. Eigentlich müsste man das folgende Chartbild nicht kommentieren. Es sollte selbsterklärend sein! Im Hintergrund sollte man sich wohl -zumindest- auch die Bewertungskennzahlen KGV, KUV, KBV ansehen (auch im historischen Vergleich) ! ...des Index überprüft. Aufgrund einer quartalsweisen Rangliste - nach Marktkapitalisierung und Orderbuchumsatz - wird dann entschieden, welche Werte aus dem Index herausfallen oder eventuell neu aufgenommen werden. 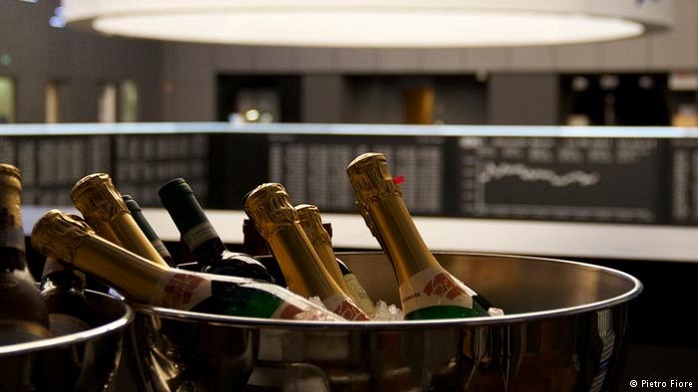 ...stocks on the New York Stock Exchange or NASDAQ. It seeks to represent the entire stock market by reflecting the risk and return of all large cap companies. 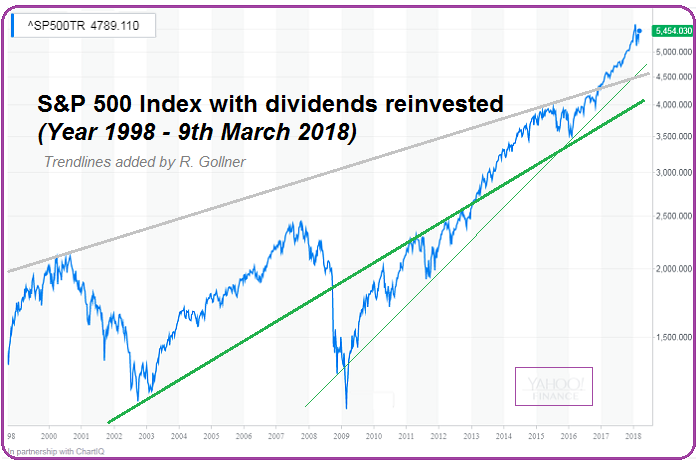 The index is designed to measure the performance of the broad domestic economy through changes in the aggregate market value of 500 stocks representing all major industries. 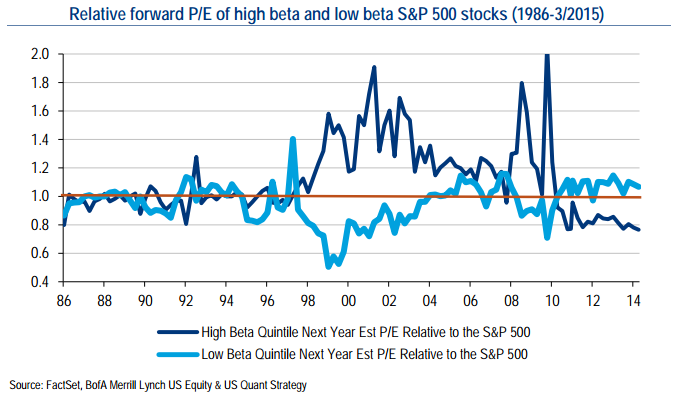 ...have a lot of conviction in their purchases as reflected by small bets. ...dieser Aktienrückkauf (engl. 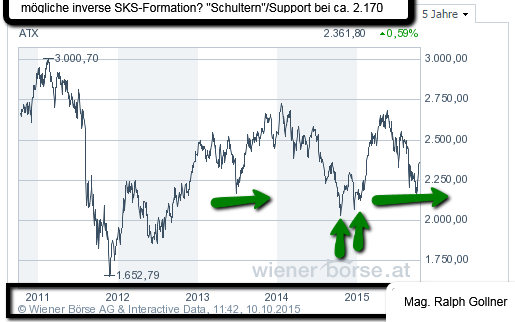 Buy Back) kann im schlimmsten Fall zu einer gefährlichen Investitionsblase führen. 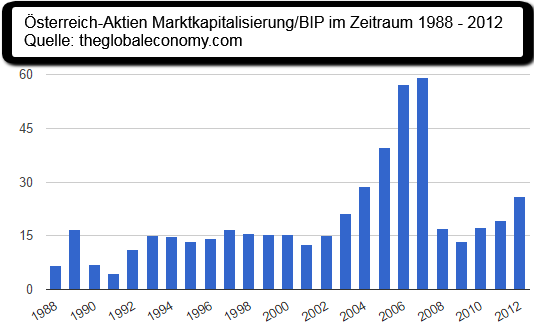 Dies gilt insbesondere dann, wenn der sogenannte "Leverage-Effekt" im Spiel ist und Unternehmen den Aktienrückkauf nicht mit Eigenkapital stemmen, sondern Geld dafür aufnehmen. But this is an incomplete list. 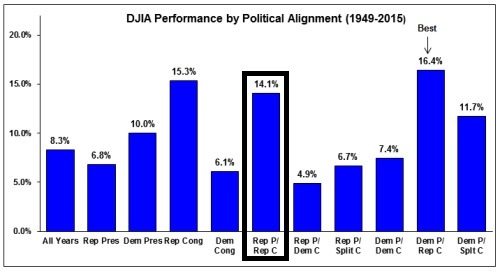 It does not include any early financiers like J.P. Morgan, no chief strategists like Abby Joseph Cohen, and no Fed chairman like Alan Greenspan. 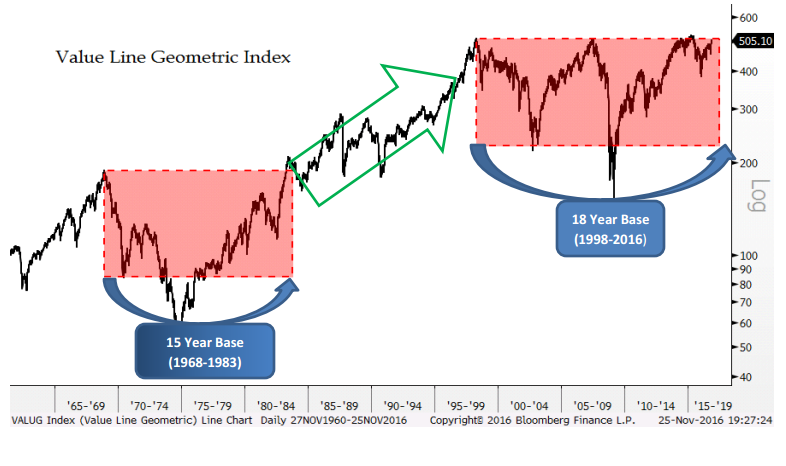 S&P 500 Rainbow Chart of the "90s"
We could wait and see if that level will also be defended as per month close of Jan. 2017. 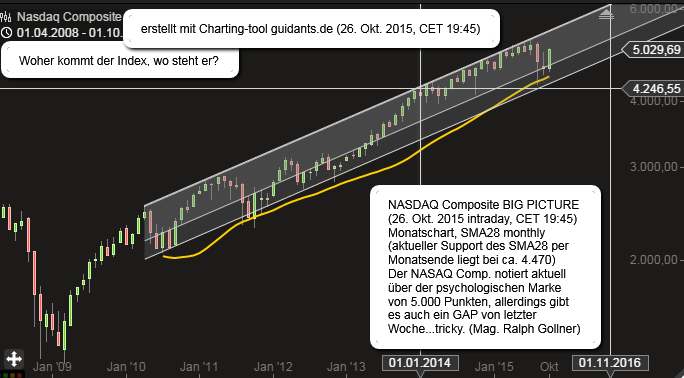 Furthermore the technological-oriented "sister" NASDAQ 100 (Tech-Index) also surpassed a psychological level: 5,000! One should compare apples with apples, but this is pretty hard. Just remember that each of the Indices is in local currencies. 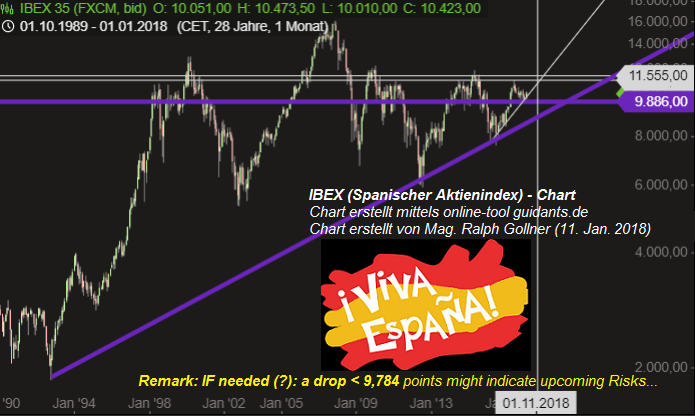 Examples: Nasdaq-stocks in USD, DAX in Euro, etc. 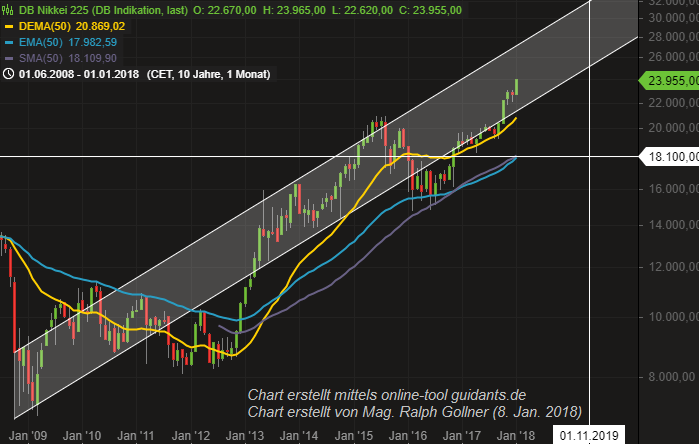 Die 200-Tage-Linie gehört zu den einfachsten und bekanntesten Hilfsmitteln der Charttechnik. 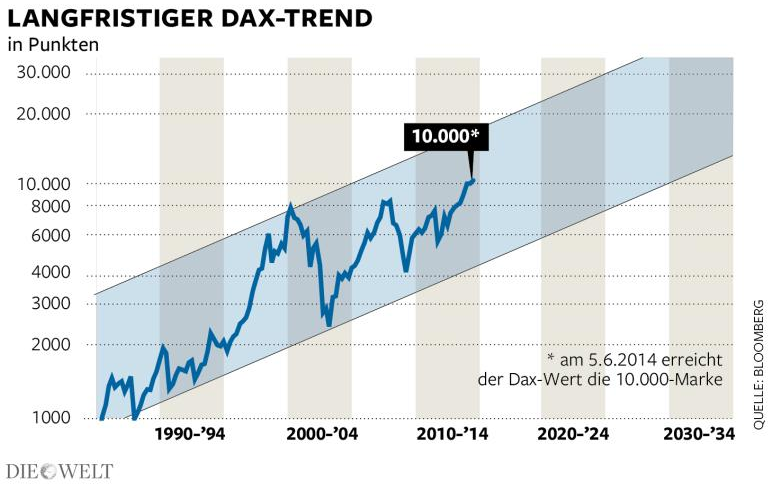 Der ursprüngliche Zweck des Indikators bestand darin, die oft wilden Kursschwankungen von Aktien oder Indizes zu glätten, damit der große Trendbesser sichtbar wird. 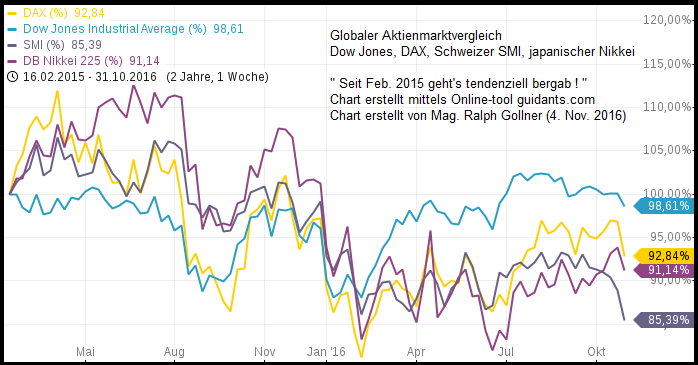 Seit Feb. 2015 stocken die globalen Leitbörsen der Welt. Zwischendurch haben jedoch einige Teilbörsen (wie der brasilianische BOVISPA) durchstarten können. 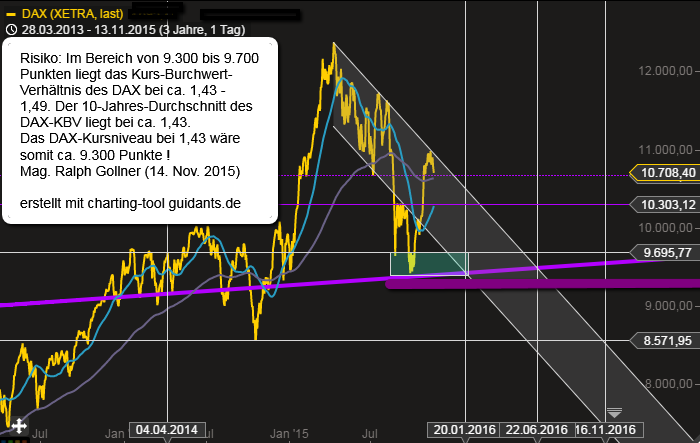 Warren Buffet hatte insbesondere in 2015 einige Probleme! Seit Okt. 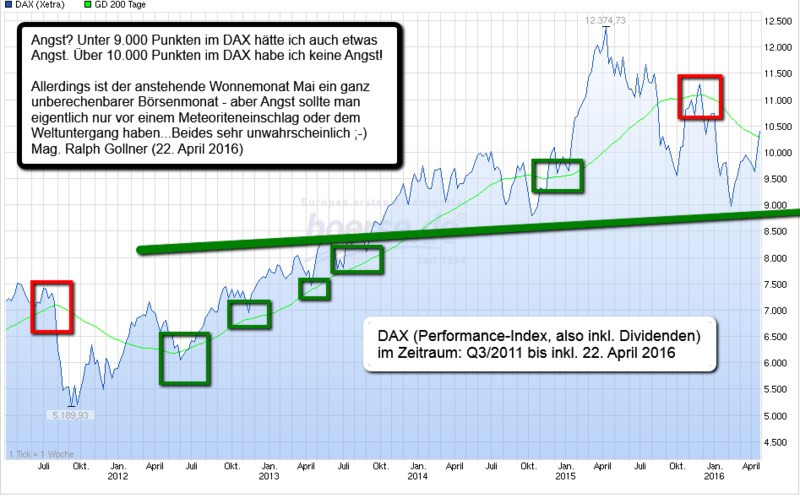 2015 schwankt der deutsche Aktienindex DAX in einem Korridor von ca. 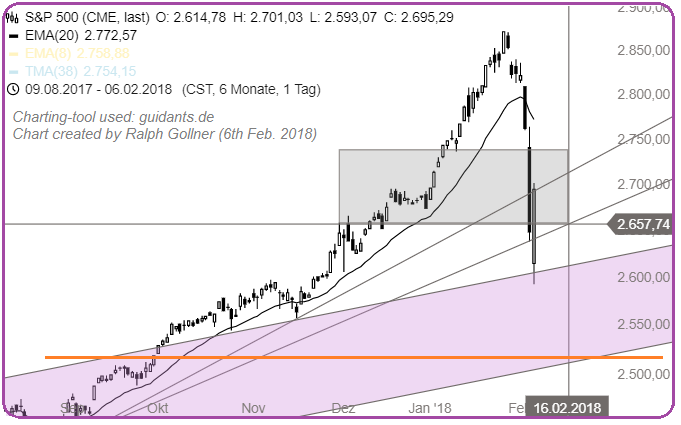 2.600 Punkten. Sowohl die Themen "China-Unsicherheiten" im Q1-2016, sowie das Brexit-Voting im Juni 2016 fallen in diesen Zeitraum/Demarkationslinie: ca. 10.000 Punkte. Bei meinen Recherche nach den langfristig interessanten Möglichkeiten im Bereich Geldanlage kommen mir immer wieder Sparpläne unter. Das Problem ist hier jedoch oft, dass der interessierte Anleger teilweise garnicht versteht, was hinter dem Sparplan eigentlich steht. Der österreichische Aktienindex, kurz ATX, ist relativ volatil, weil er denn auch zyklische Branchen schwer gewichtet hat. 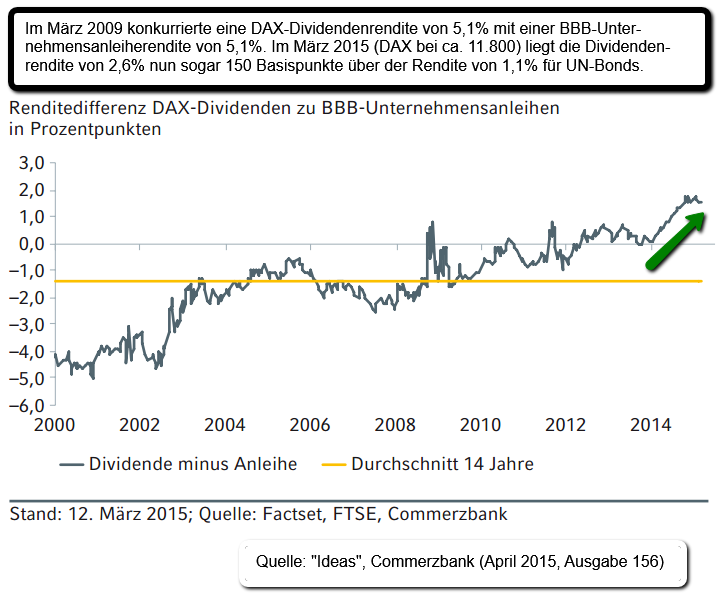 So ist beinahe die Hälfte des Index mit Finanzdienstleistern oder Industrieunternehmen bestückt, wie z.B. 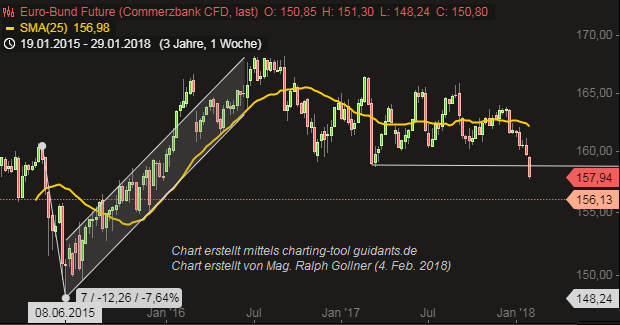 Banken oder Versicherungsunternehmen. 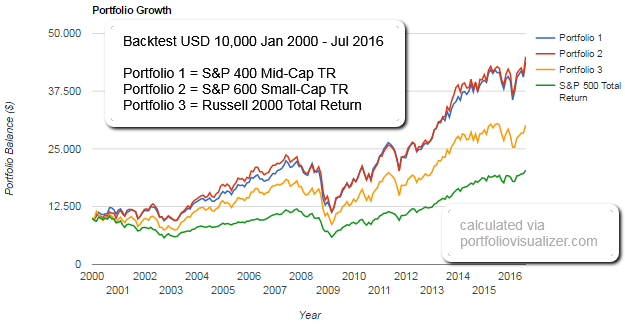 An ETF on the S&P SmallCap 600 provides diversified exposure to U.S. small-cap stocks. 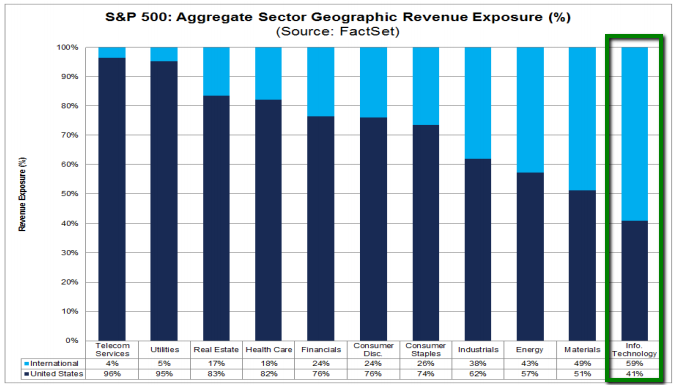 The S&P SmallCap 600 Index is well diversified by sector and security with the highest exposure to financials, industrials and information technology. Investor appetite for emerging-market bonds has pushed buying in debt-oriented funds tied to those regions to records. Net inflows to funds that buy EM-bonds reached an all-time high in the week through 20th July. 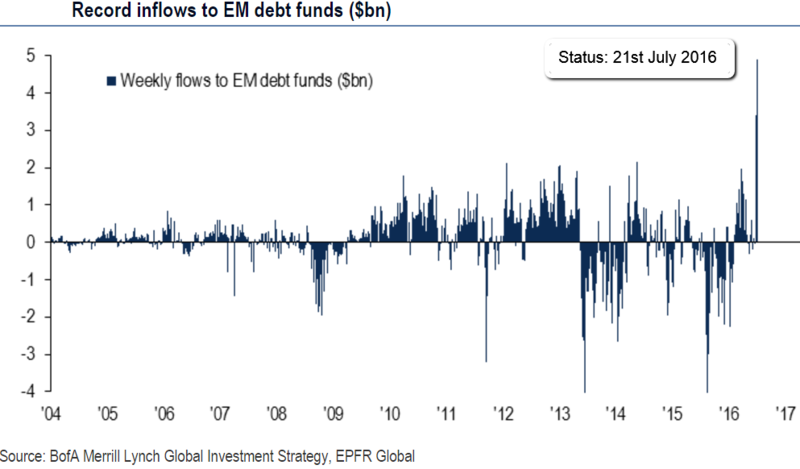 Roughly USD 14 billion has poured into emerging-market debt over the past four weeks, marking the longest streak of buying in emerging-market debt funds since September 2014, according to a weekly report on funds flows from Bank of America Merrill Lynch. 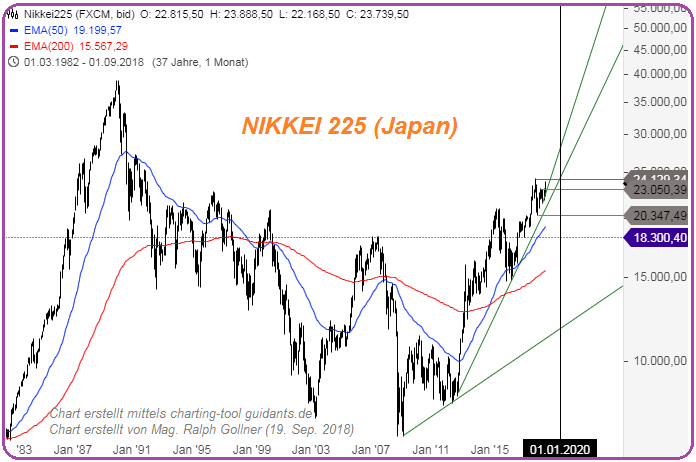 Developed in the 18th century in Japan to trade rice, Renko charting is a trend following technique. 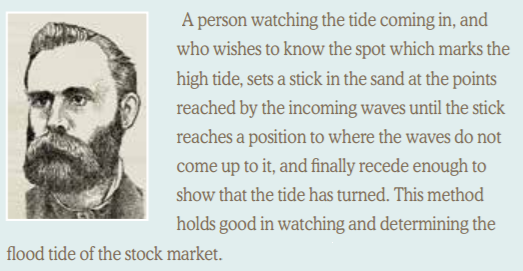 Lateron Renko-Charts were found useful in trading any other financial instrument, like stocks for instance. 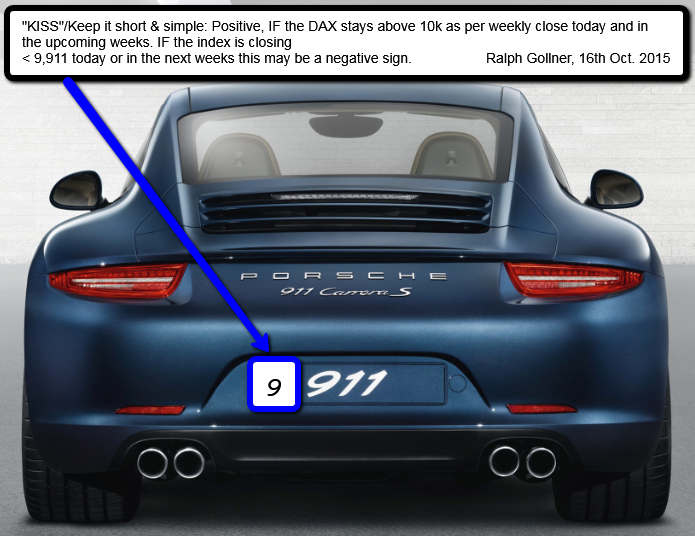 It is excellent for filtering out price "noise" so traders can catch a major part of a given Forex trend, or Stocks-trend, etc. It was believed that the name "Renko" originated from the Japanese word 'renga' meaning 'brick'. 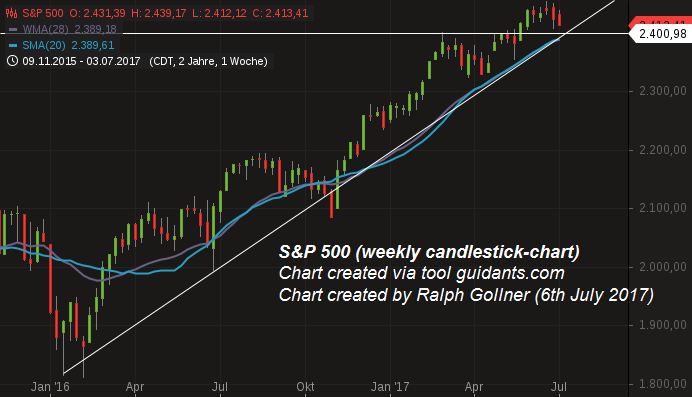 S&P 500 reached an All-time high weekly close! Geschüttelt, nicht gerührt...Folgend dem BREXIT-Voting gingen kfr. mal alle Sicherungen durch. 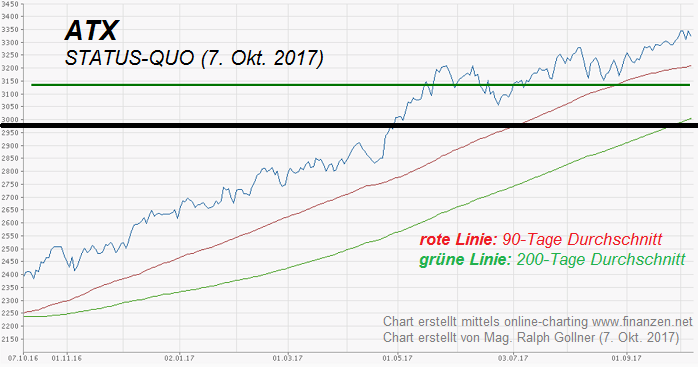 Derzeit wird am Versuch einer Stabilisierung im Bereich 9.100 bis 9.800 Punkte gearbeitet - RISKY! 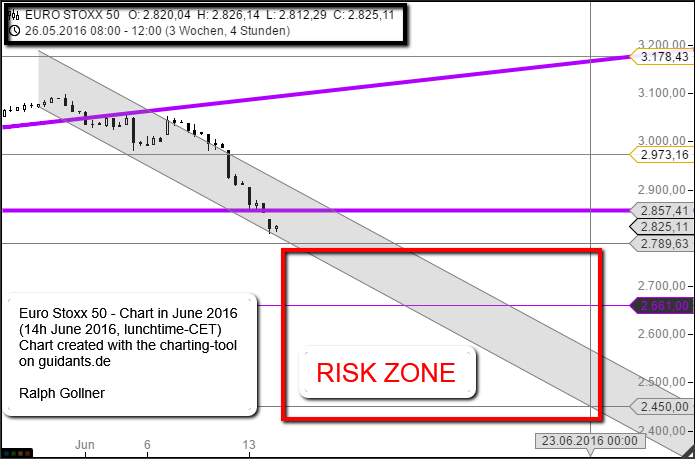 Investors in European stocks are fearful - since the Brexit-voting will take place on the 23rd June 2016 with unknown consequences. 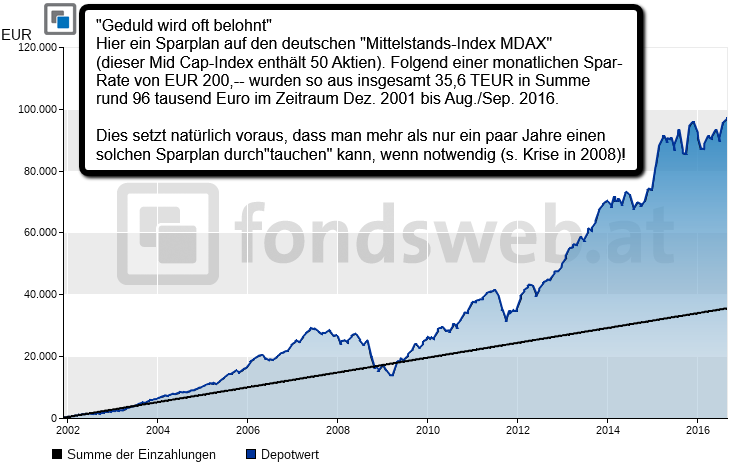 Mit mehr als 9.300 Punkten hat der SDax sich zum renditeträchtigsten Index in der deutschen Börsenlandschaft emporgeschwungen. 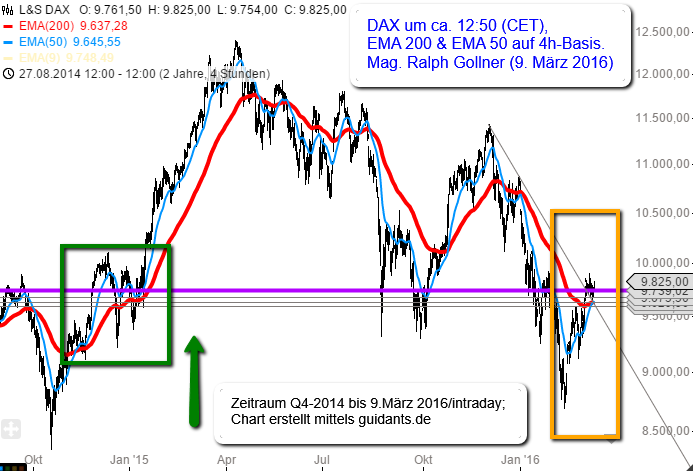 Dax, MDax und TecDax notieren zum Teil deutlich unter ihren hist. 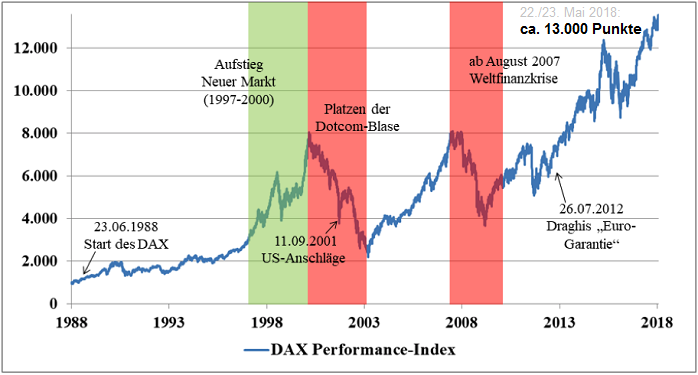 Höchstständen, der SDax stand zeit seiner Geschichte noch nie so hoch. 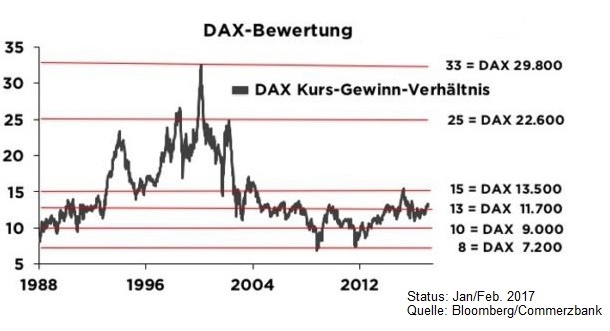 Den SDax gibt es in seiner jetzigen Form noch nicht so lange: Eingeführt wurde er erst im Jahr 1999; und erst seit 2003 besteht er aus 50 (statt zuvor 100) Werten. 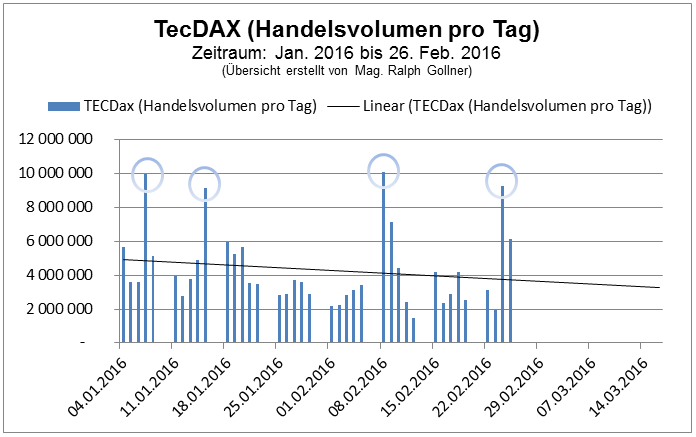 Zu diesem Zeitpunkt erhielt er mit dem TecDax noch einen Index-"Bruder". 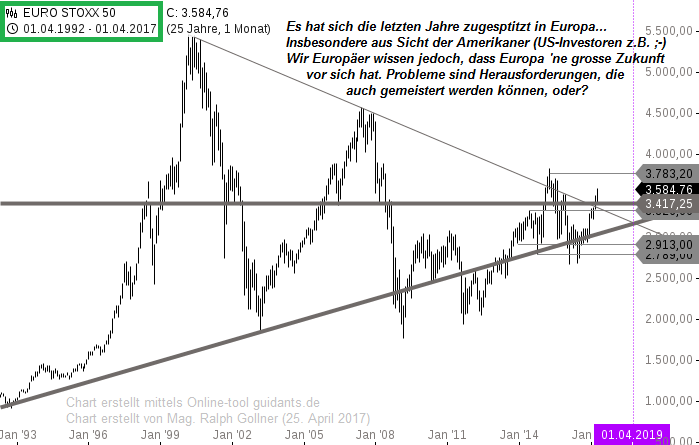 Aktien (US-Aktien) steigen im langfristigen Bild die überwiegende Mehrheit der Zeit. 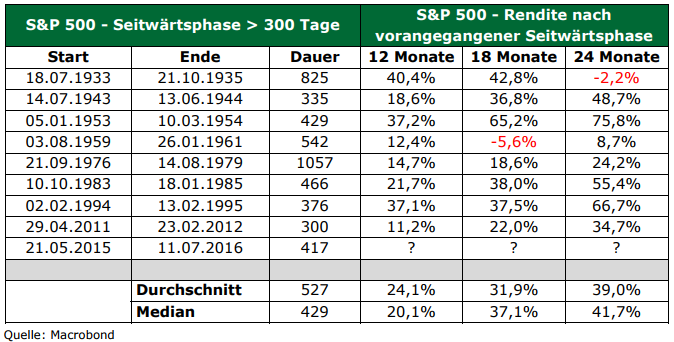 Meine Berechnung (unter Verwendung von Daten von NYU Stern) hat ergeben, dass in 66 der letzten 88 Jahre der S&P 500 positive Jahre hatte. 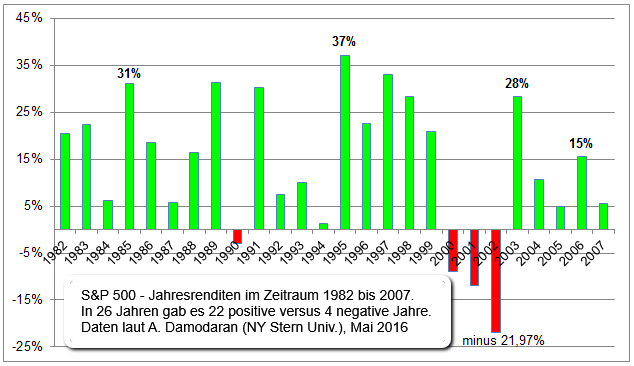 73% positive Jahre! ...as clashes between communism and capitalism dominated the decade. 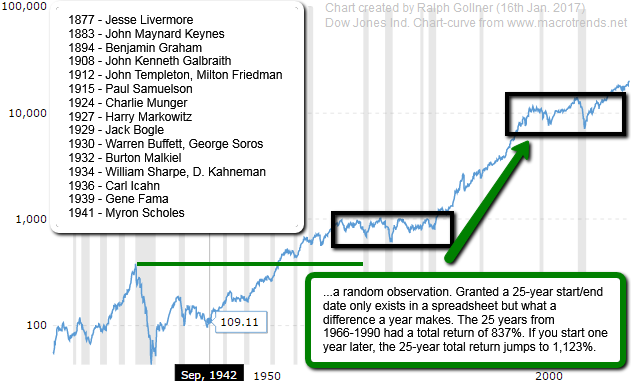 Still, only 2 negative years occured between the years 1949 and 1962! 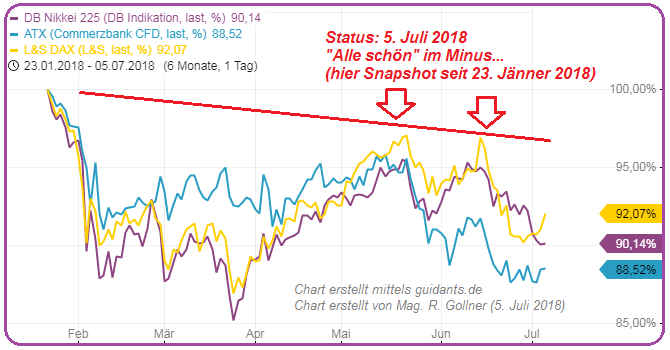 Als ATX-Investor ist man sich dessen besonders bewusst, da teilweise doch eine Korrelation zwischen den Märkten bestehen mag. Der ATX is evtl. 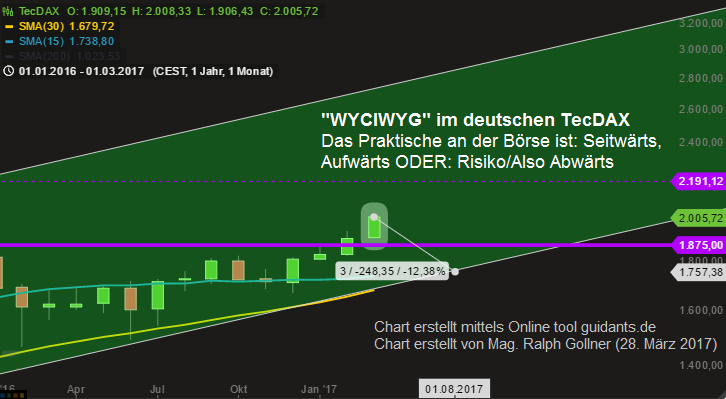 so etwas wie die Salami im DAX-Russland-Sandwich. 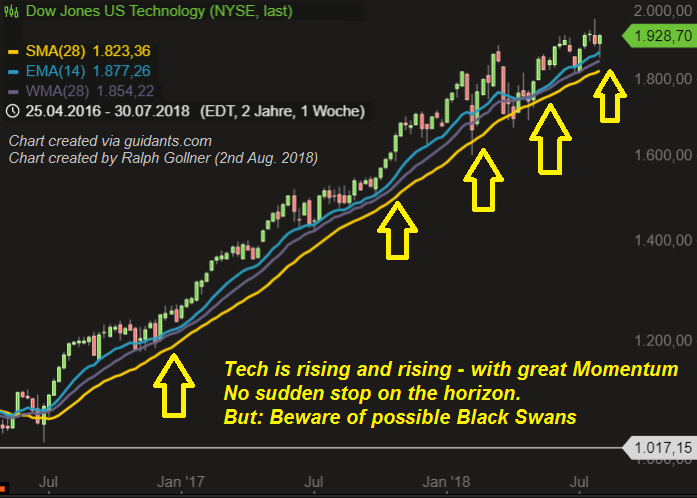 A bullish ‘golden cross’ chart pattern has appeared in the Dow Jones Industrial Average, and this one may have a better shot of working out for investors than the one that failed just four months ago. 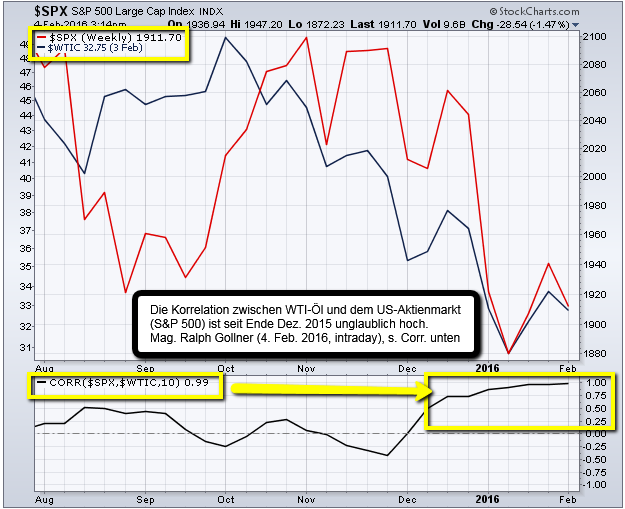 Die Korrelation zwischen Öl (Sorte WTI) und dem S&P 500 bewegte sich im Januar 2016 auf einem Niveau, welches in den letzten 26 Jahren nicht mehr erreicht worden ist. Die Korrelation im Jänner 2016 hat ca. 0,97 betragen, höher als jede andere Monatskorrelation seit dem Jahr 1900 (Quelle: Wall Street Journal). 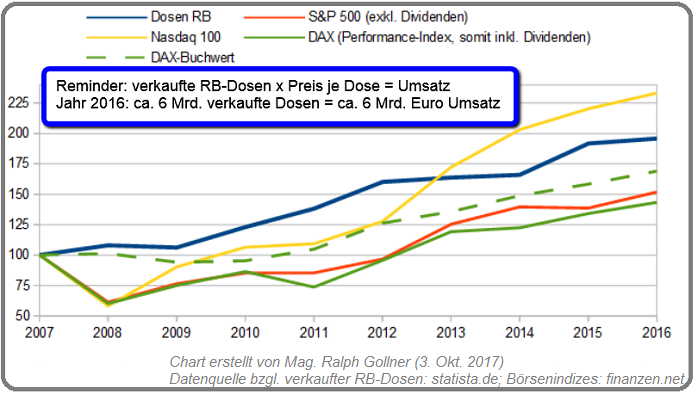 Eine Korrelation von 1 bedeutet, dass sich Öl und Aktien proportional in die gleiche Richtung bewegen (während minus 1 für einen entgegengesetzten Verlauf steht). 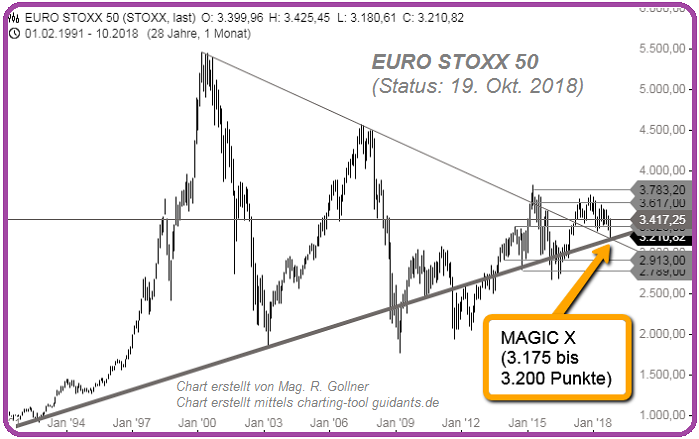 Der CECE-EUR Index (Osteuropa-Phantasie) ist auf einem Vier-Jahres-Tief, wie Stefan Mayriedl per boerse-online anmerkt. 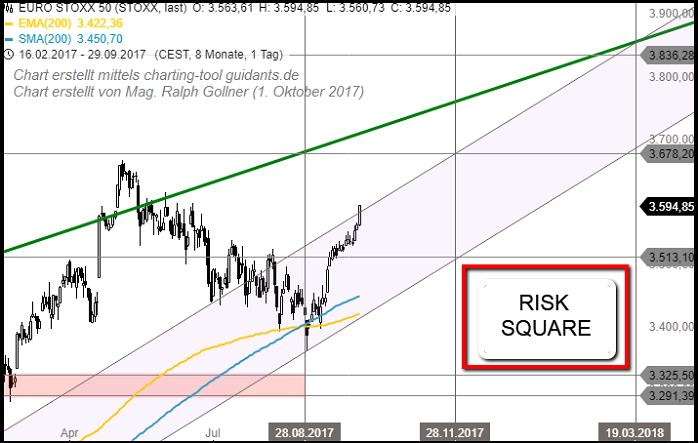 Osteuropäsiche Aktien sind im Moment völlig out (Q4-2015, Anfang Dez.). 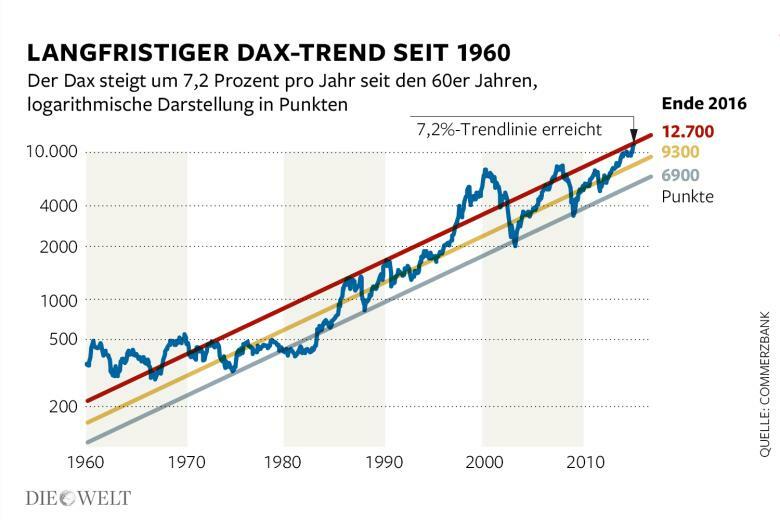 Der bekannte CECE-EUR-Index, welcher die Aktienmärkte Polen (zu über 70 Prozent), Tschechien (knapp 20 Prozent) und Ungarn umfasst, ist am 2. Dez. auf 1419 Punkte und damit den tiefsten Stand seit September 2011 gefallen. 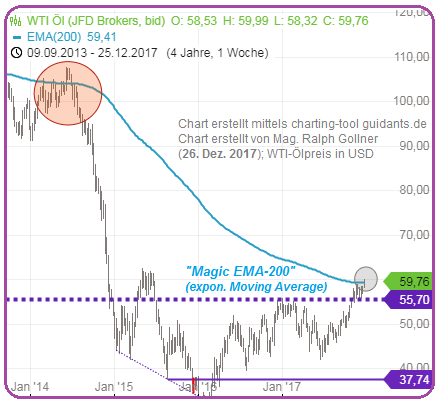 Getoppt wurde dies per heutigem Schluss (3. Dez. 2015) auf einem Niveau von ca. 1380. Too often one can see that private investors are concentrating their investments in one region, sometimes even only in their home-country (Home-Bias). 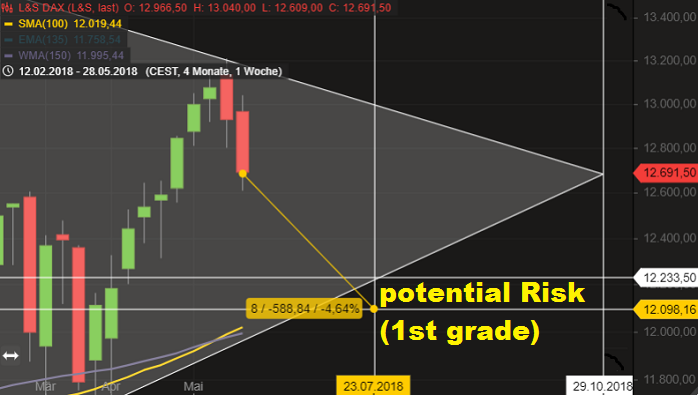 This leads to high risk, sometimes also to high outcome. If one is aware of that fact, it's your choice. 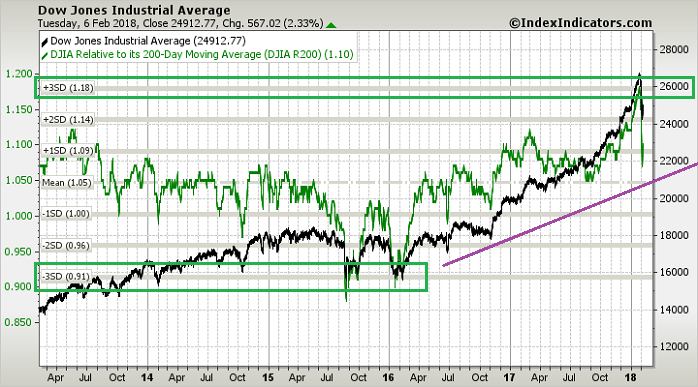 Let us REFOCUS on the 200-daily Moving Average...as long as the Index stays above 11.111 points, or at least 11k the index looks stable. Still, there lies a gap around 10,5k - who knows if (and/or when) it will be closed? Today, South Africa has 90% of the world's platinum, 80% of its manganese, 75% of its chrome and 41% of its gold, as weel as vital deposits of diamonds, vanadium, and coal. 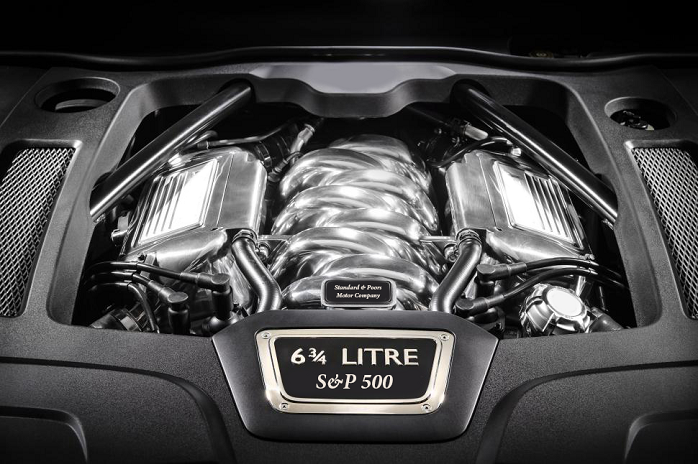 As per 2015, South Africa is the largest economy in Africa, with a sophisticated financial structure. 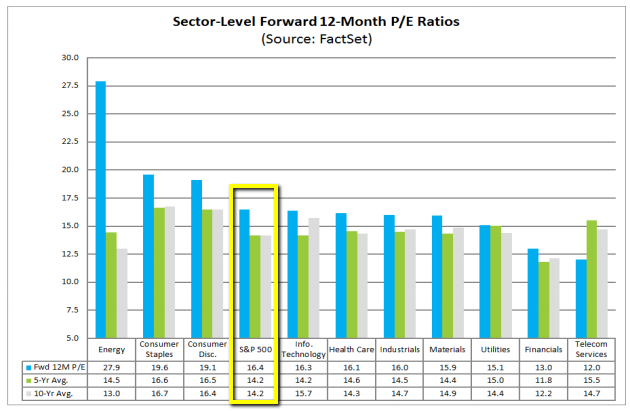 Financials account for 24%, while basic minerals lag behind with only 8% of the market capitalization. 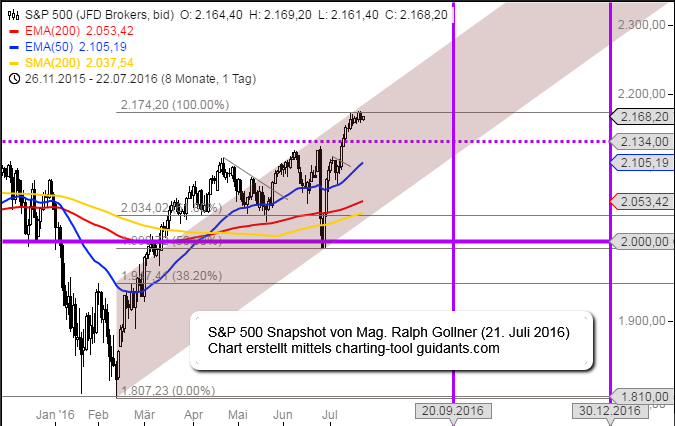 Taken together, media and mobile communications account for 26% of the market index. The S&P 500 Index was up more than +20 % over the last 55 trading days up to 15th March 2019 (admittedly a cherry picked number - to quote "OddStats/Twitter-account"). 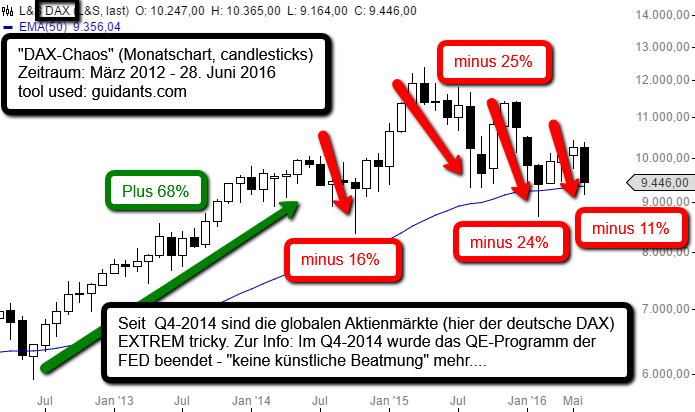 Ein Quartal ist kein Quartal. 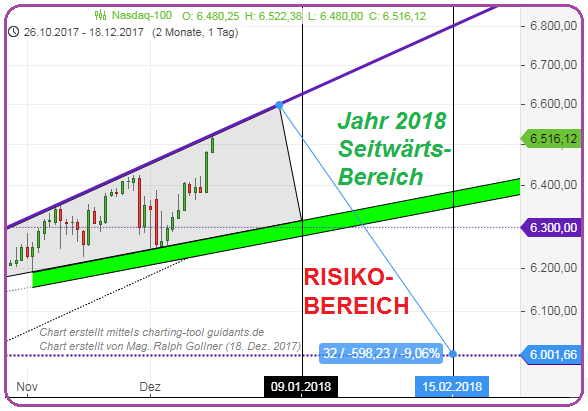 Also, Tee trinken, oder Neujahrs-Sekt und auf 2019 hoffen. 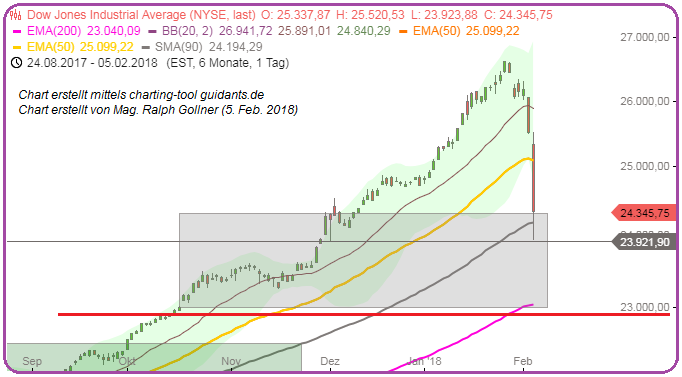 Notierungen über 23.800 Punkte im DOW sollten zu keinen weiteren Panikattacken (mehr) führen. 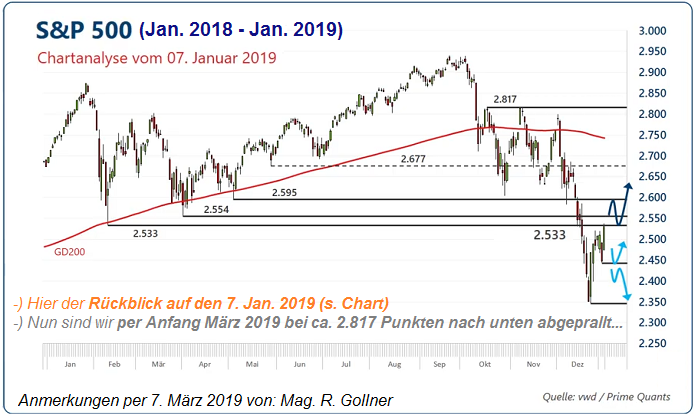 Sollte der Index jedoch in den nächsten Wochen abrupt abrutschen und gar unter 22.700 Punkte fallen, wird es spannend. 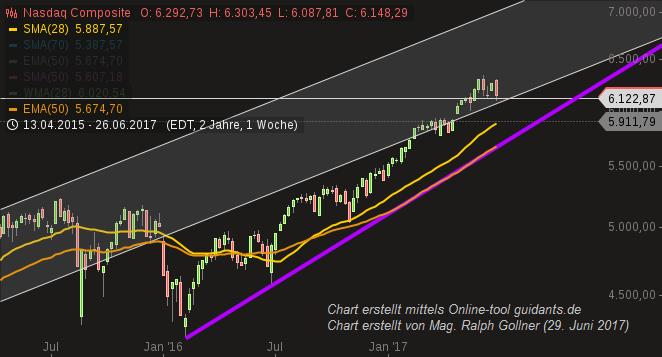 Aktuell hält sich der Nasdaq Composite noch über den 6.800 Punkten, welche ich im Chart anbei eingetragen haben. 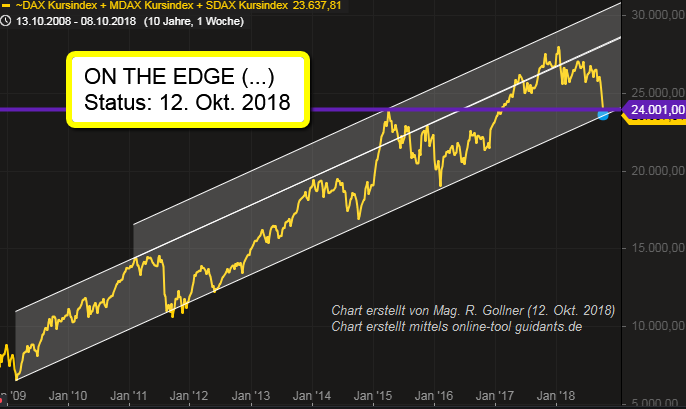 Nach dem rasanten Abschwung im Monat Oktober kann man nun hoffen, dass es einen Bounce gibt, bzw. eine V-förmige Erholung! Langfristig auf Monatsbasis noch (!) 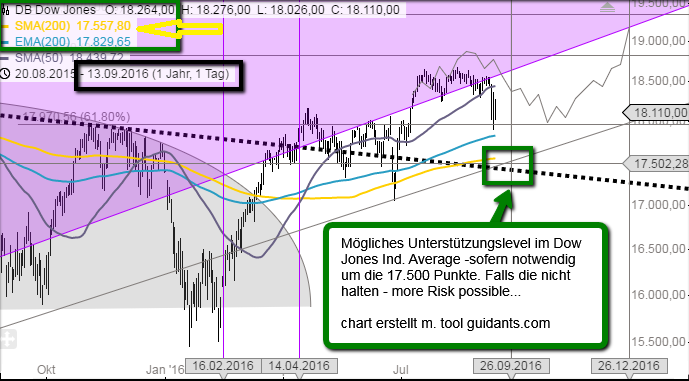 neutral bis leicht positiv..
ALLERDINGS gibt es Momentum auf der "Downside"! Einfaches Resumé: "To be or not to be" (kurz- bis mittelfristig). 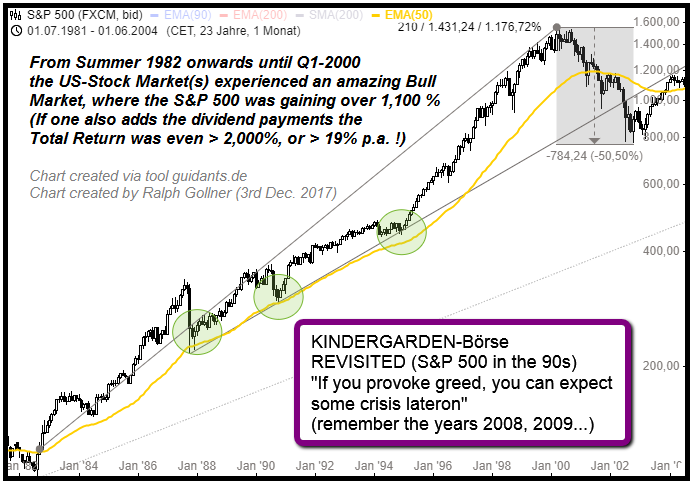 vs. Nasdaq-100, Dow Jones & Co.
Vor dem Jahr 2000 war die Aktienwelt ein Kindergarten. 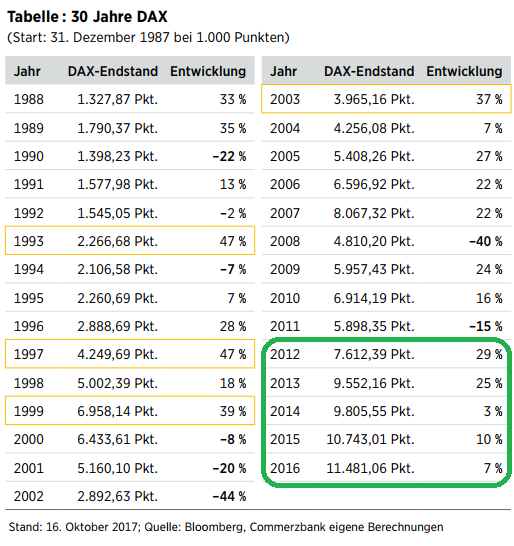 Alles ist gestiegen, egal wo, wie, wer (Achtung: "Etwas übertrieben")...Seit dem Jahr 2000 muss man schon ein bissl mehr leisten als aktiver Profi (Golfspielen alleine reicht nicht). 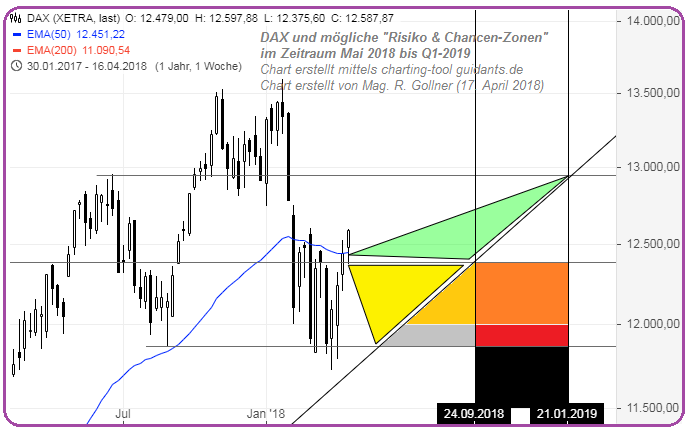 Happy Börsday, lieber DAX ! 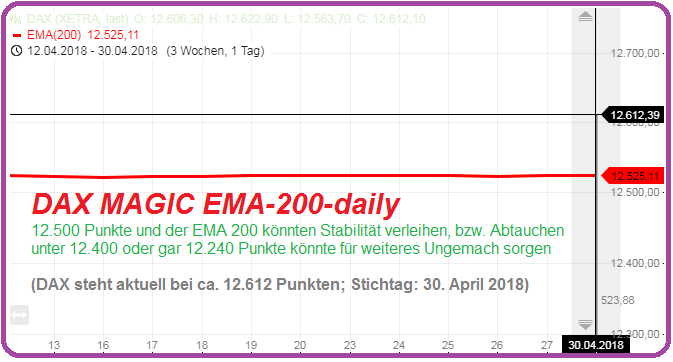 DAX-Kursverlauf ist ausgeblendet und soll die magische, AKTUELL stabile EMA200-Durchschnittslinie und deren Relevanz hervorheben! 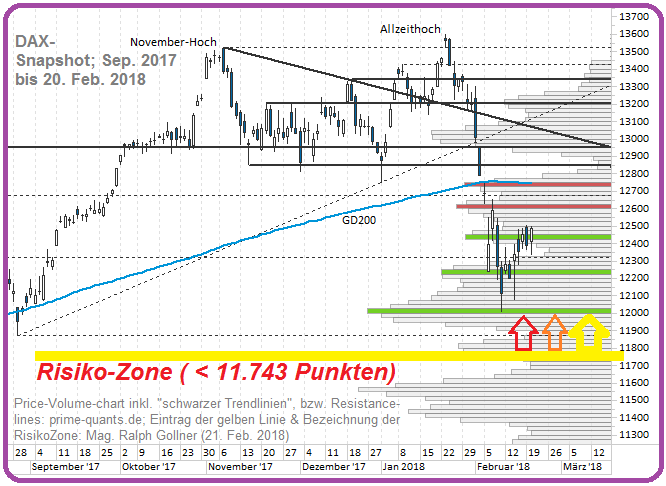 DAX und mögliche "Risiko & Chancen-Zonen"
...the magic stories about that level (area) are accompanied -mainly- by the SMA200-daily and/or the EMA200-daily. 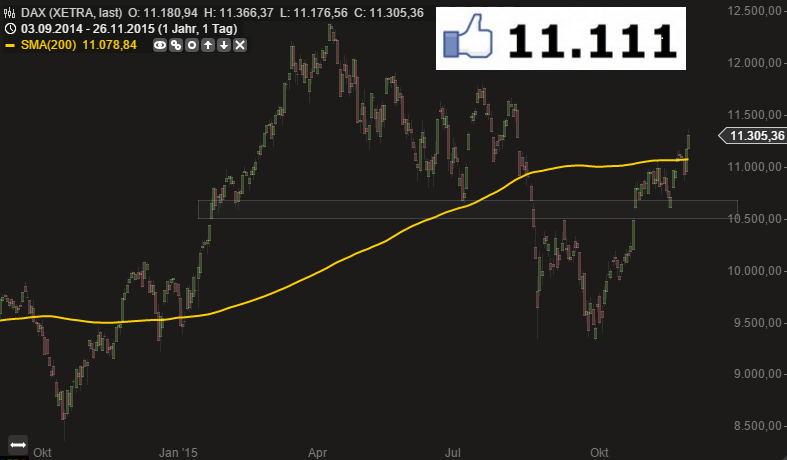 These Moving-Averages may give support (or eventually serve as resistance) in the next days or weeks. 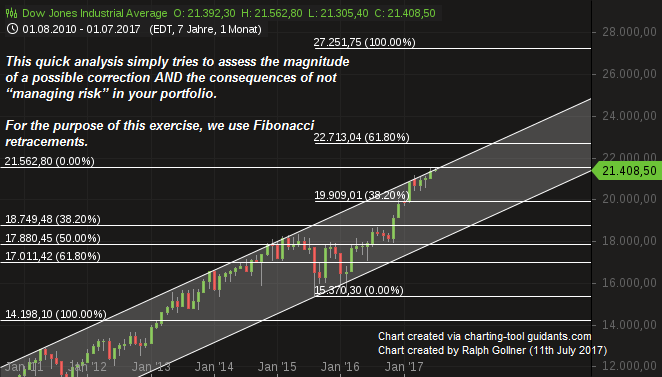 NASDAQ and levels > 7,000 points ! 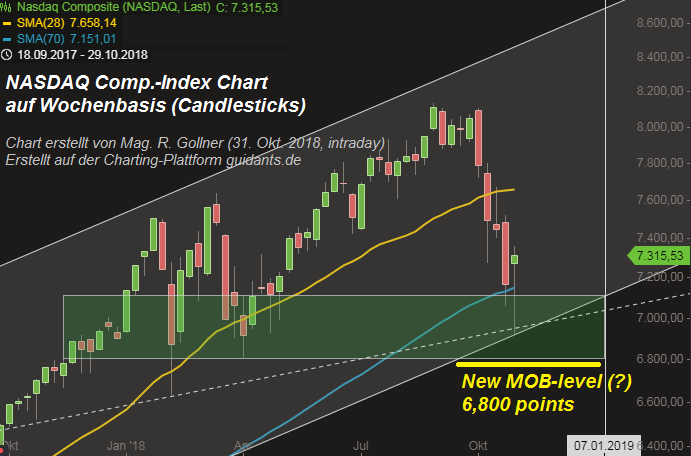 NASDAQ & levels > 7,000 points ! 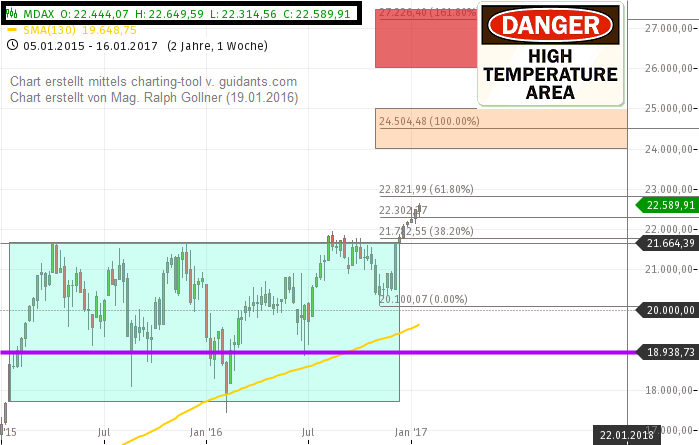 Dow Jones hits another milestone, climbing over the 25,000-hurdle! 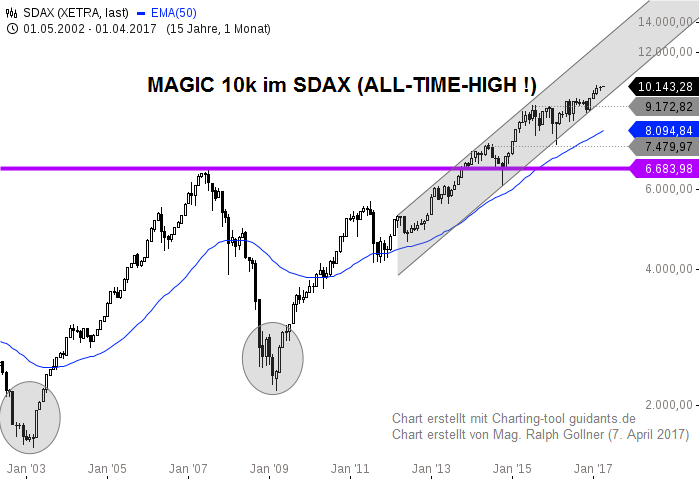 Solange der NASDAQ-100 Index mit den bekannten Tech-Stocks & Co. über den magischen 6.000 Punkten verbleibt, kann man auch zuversichtlich in das Q1-2018 schauen. ...who got a free lunch over such a long stretch of time! 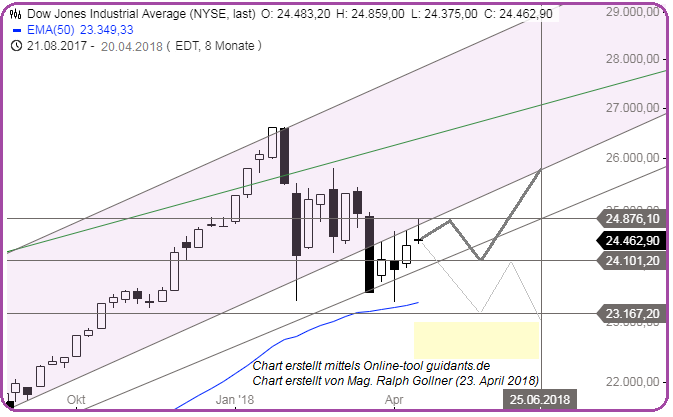 The Nasdaq-100 along with its components like Amazon (near USD 1,000 - level) is fighting against the roof - placed @ a level of 6,000 points. 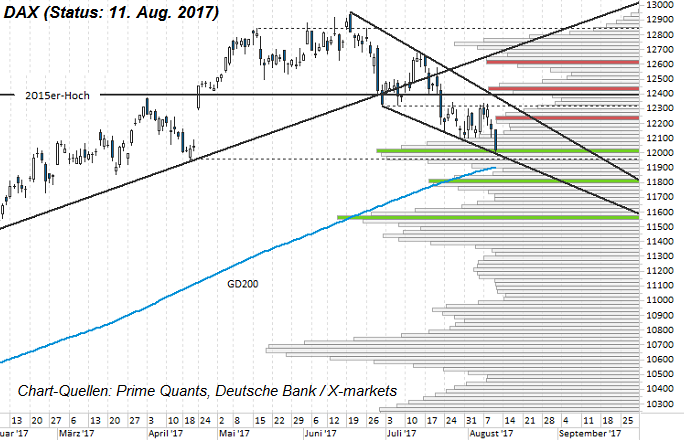 Either the NDX fails again or breaks through that level with a closing > 6k on a friday? 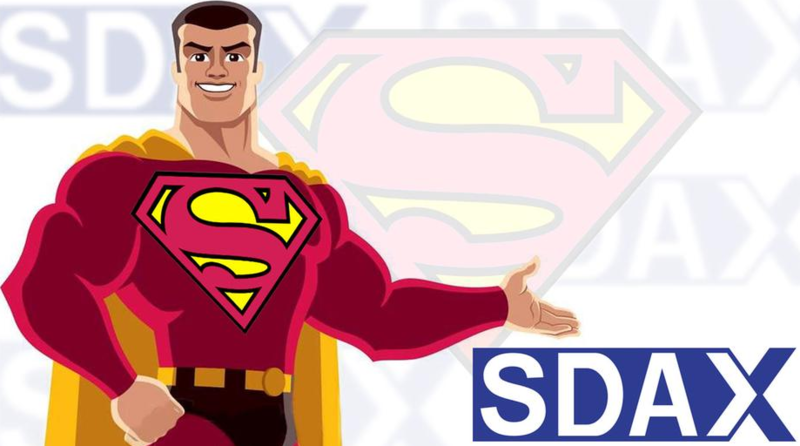 Since Wed., 16th Aug. 2017, the IT-SubSector-Index is fighting to hold the 1,000 - level - as can be seen in the following graph. A pretty tough fight may be carried out in the months of September and October 2017. 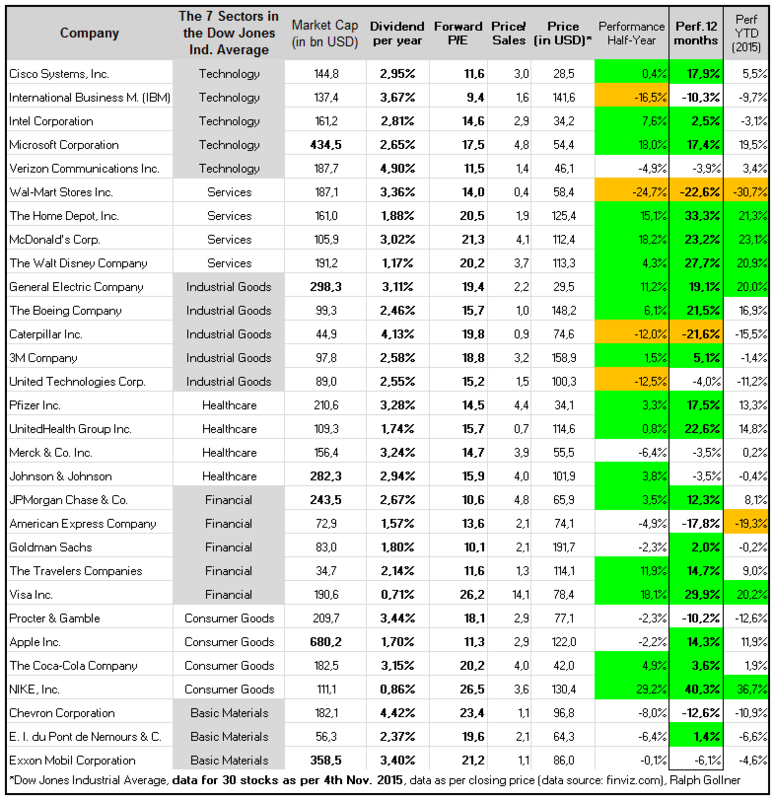 The dogs of the Dow theory is a classic investment strategy where one invests in the 10 Dow stocks with the highest dividend yield at the end of each year and hold those stocks for exactly one year. 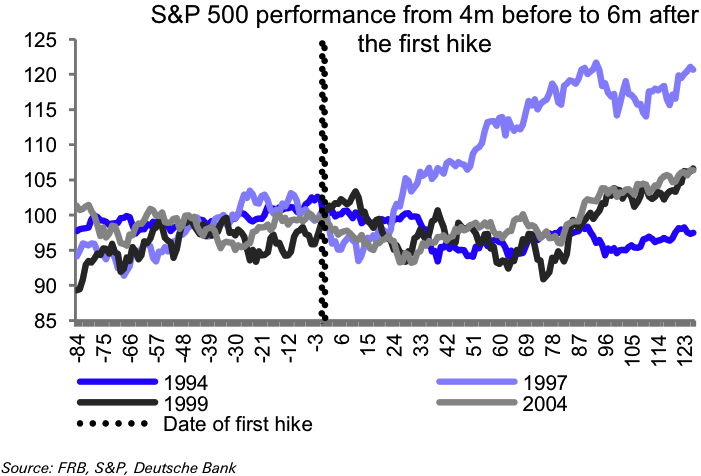 The strategy has yielded nice gains through the years. Am 14. 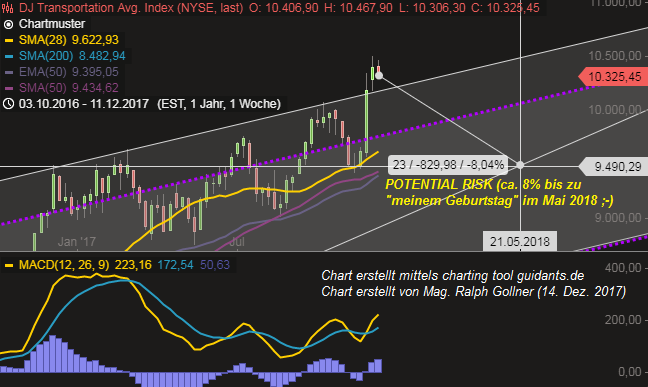 Nov. 2016 notierte der Dow noch bei ca. 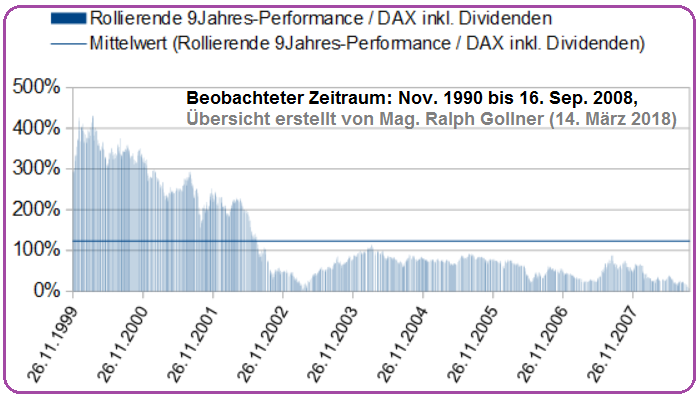 18.888 Punkten. 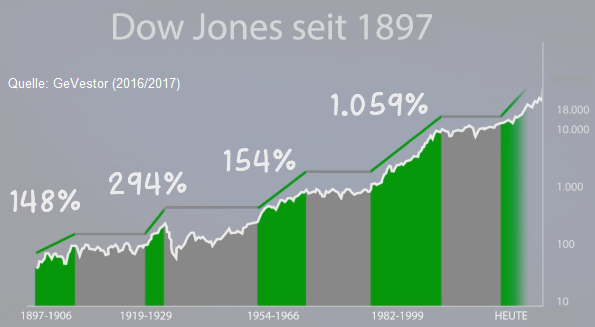 Vor noch längerer Zeit -damals - im Jahr 2000, hat der Dow Jones bereits fast die 12.000 Punkte erreicht. 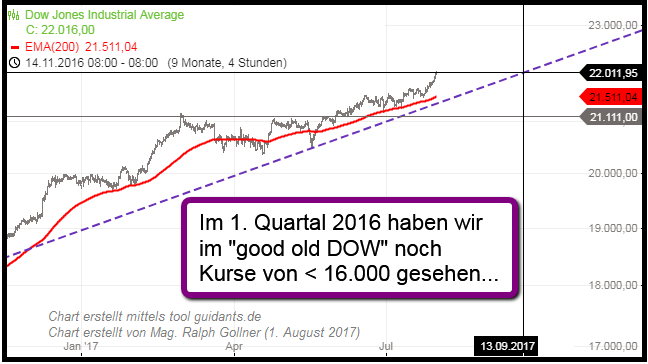 Somit ist der Dow Jones in den letzten 16 Jahren in Summe ca. 10.000 Punkte gestiegen. Möglicher Worst-Case, möglicher Alternativ-Case. 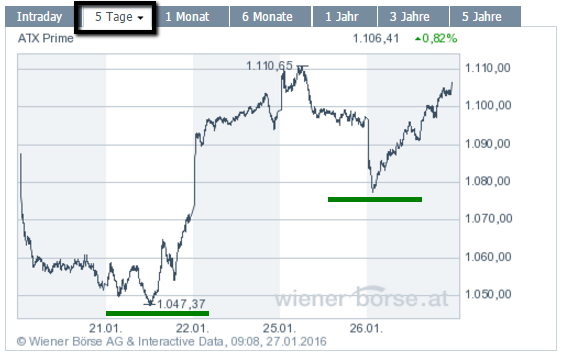 Langfristiges Kurspotential: Bewertung lässt DAX-Stand von ca. 27.000 Punkten im Jahr 2028 möglich erscheinen. 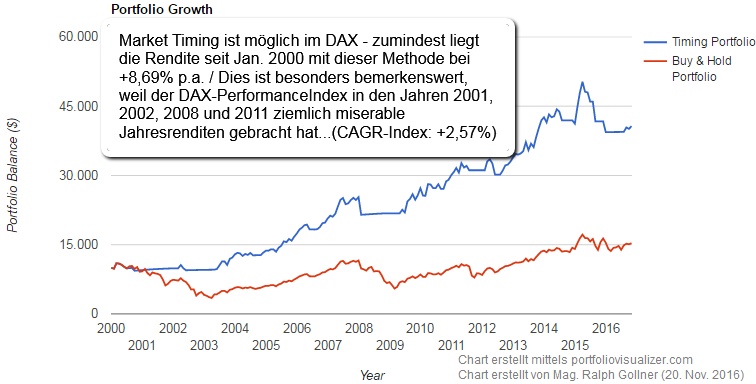 Der deutsche Aktienmarkt wurde zum 31.01.2014 mit einem CAPE von 17,3 bewertet. 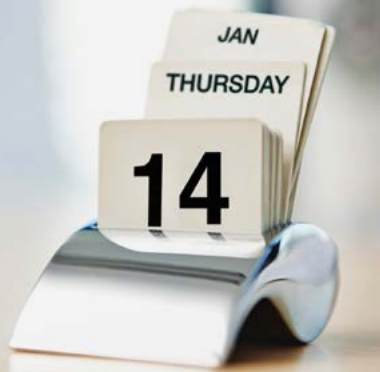 Bis zum 13. 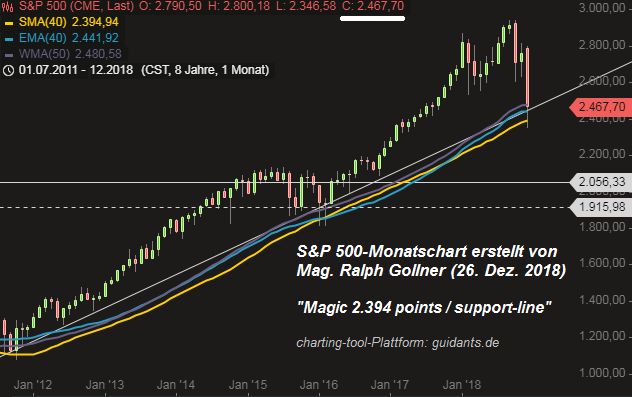 Juni 2017 (vorerst) müssen die 2.400 Punkte im S&P 500 als magische Marke herhalten, die erst nachhaltig überwunden werden muss, um einen nächsten Schritt in Richtung 2.500 machen zu können..
"Ausgangslage VOR dem 7. 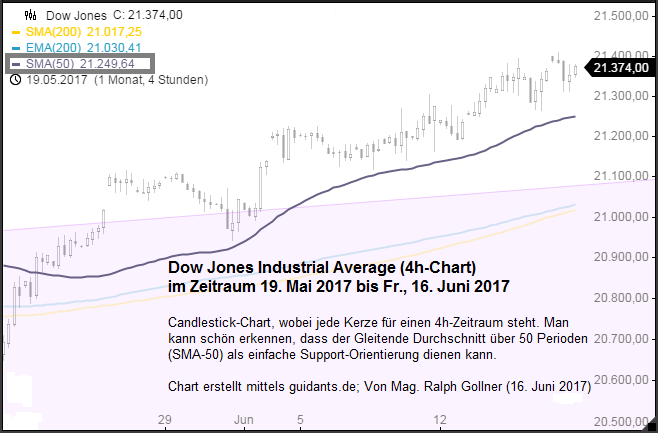 Mai 2017"
In diesem Small-Cap Index tummeln sich Aktien von Unternehmen wie: Puma, Sixt, Cewe, etc. 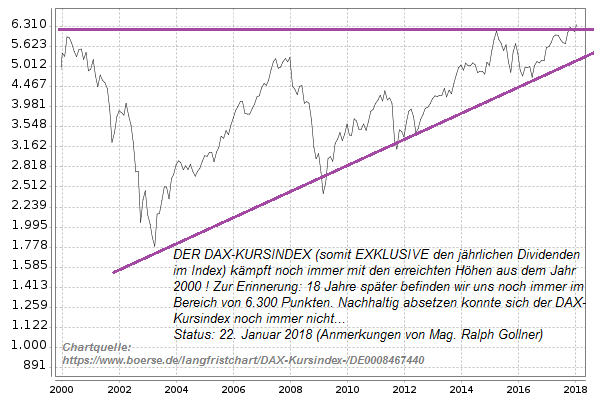 Vor kurzem markierte dieser Index wieder ein neues All-Time-High! 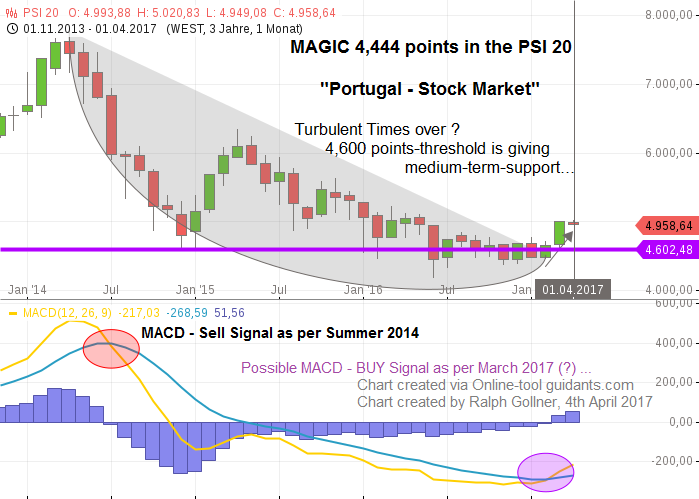 The Portuguese Stock Index PSI 20 is a benchmark stock market index which tracks the performance of 20 companies with the largest market capitalization and share turnover in the Euronext Lisbon Stock Exchange. 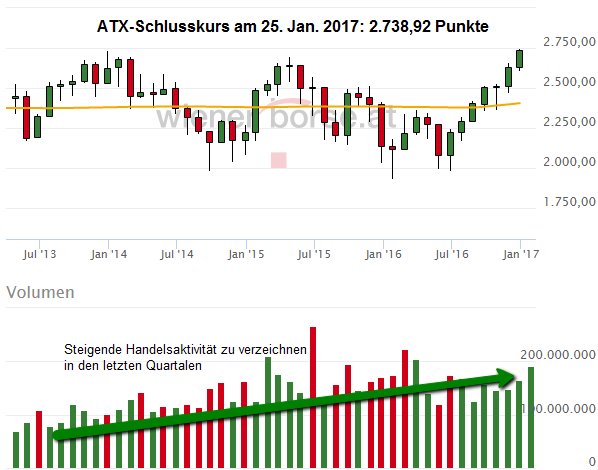 Der ATX Basic Industries (ATX BI) ist ein kapitalisierungsgewichteter Preisindex und besteht aus den Aktien der Branche Grundindustrie, die im Prime Market der Wiener Börse notiert sind. 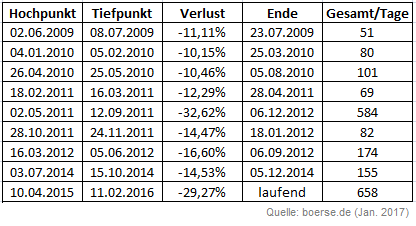 Aktuell setzt sich der Index aus 8 Werten zusammen. 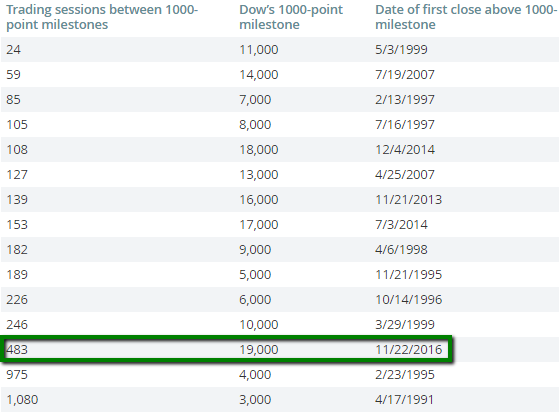 The Dow Jones Industrial Average came within a third of a point of hitting 20,000 for the first time ever. 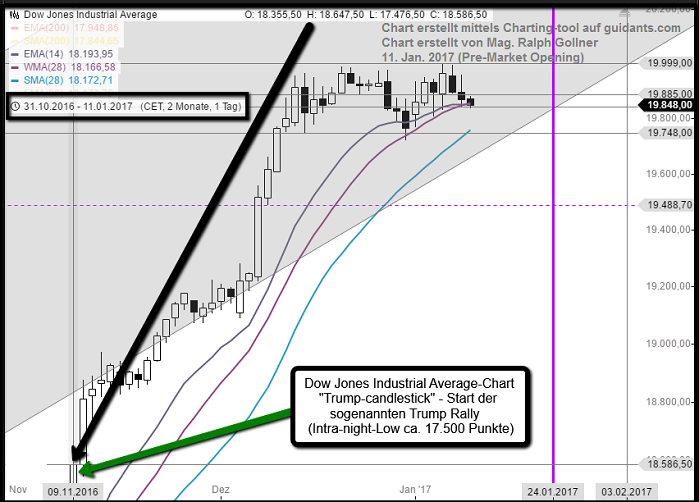 On Friday afternoon (6th Jan. 2017), the Dow hit 19,999.63, its highest point of all time. 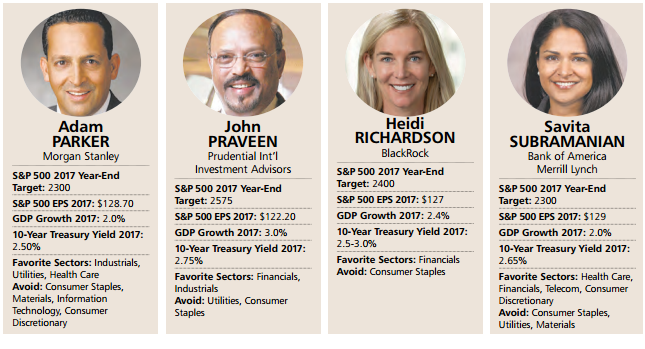 Every September and December, Barron’s surveys a group of prominent strategists at major investment banks and money-management firms to gauge their outlook for stocks, bonds, and the economy in the months and year ahead. 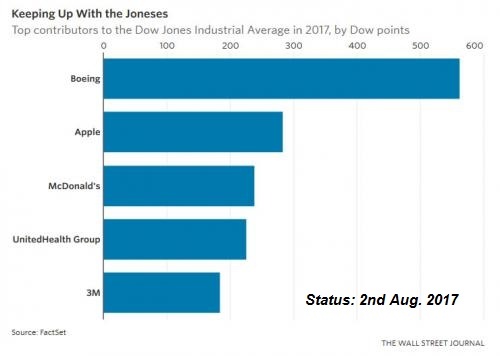 Do I hear 20,000 for the Dow Jones Industrial Average? 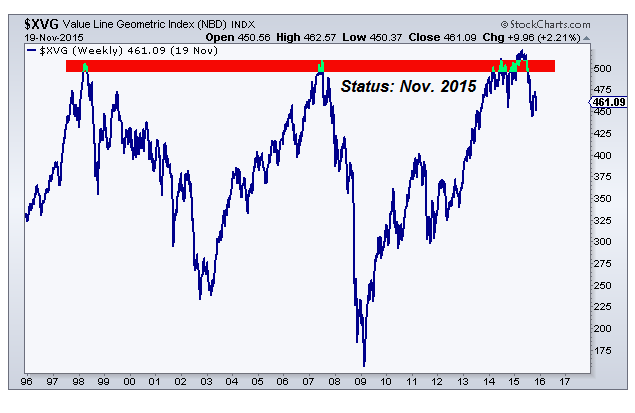 The Value Line Geometric Index (VALUG) consists of about 1,675 U.S. stocks. 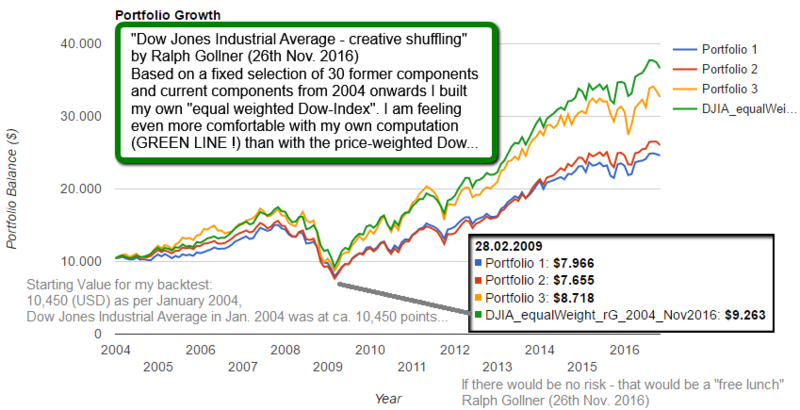 This gauge from investment-research firm Value Line gives equal weight to each of its components, while the S&P is market-cap weighted and the Dow is price weighted. 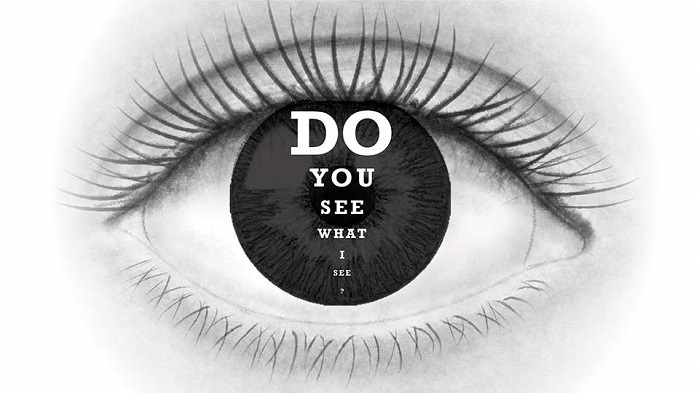 Do you remember the years 2003 and 2006? 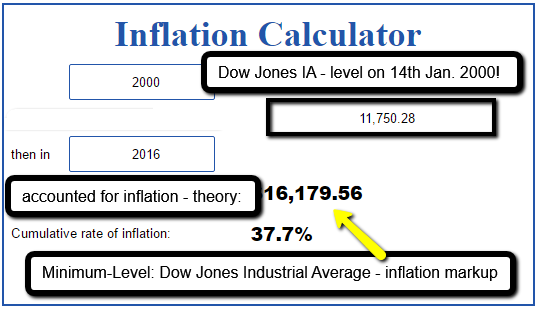 It could be, that the Dow Jones Industrial Average says goodbye to 15k forever?? Could it be? 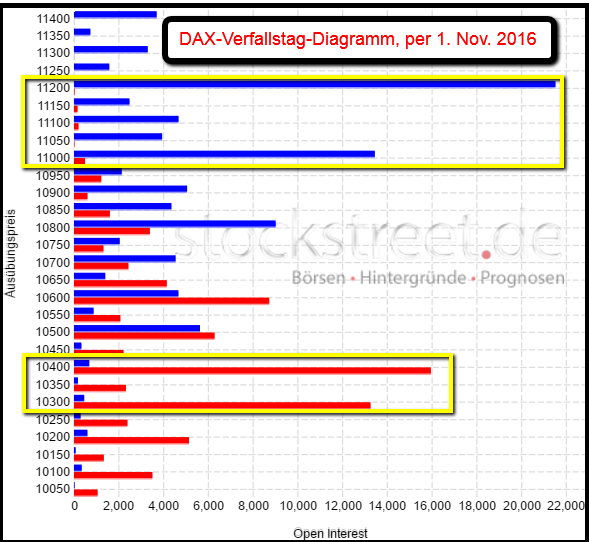 Das Verfallstag-Diagramm zeigt Ihnen übersichtlich das aktuelle Open-Interest für den kommenden Verfallstag. 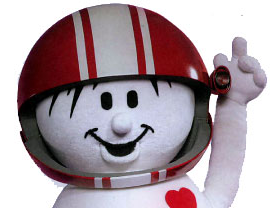 Daraus können Sie erkennen, um welchen Kurs Bulle und Bär zum Verfallstag kämpfen. 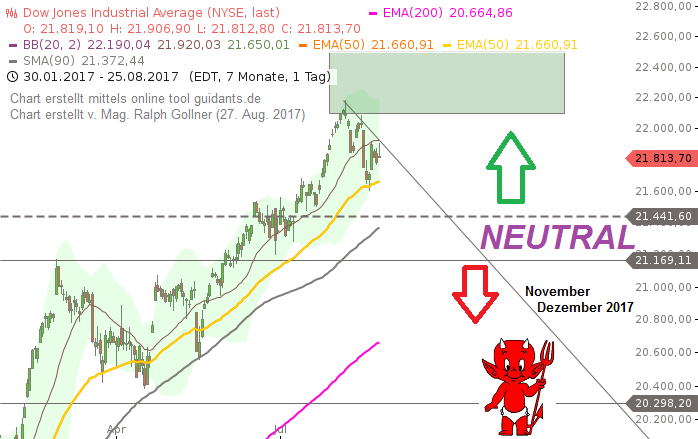 Does the well known Stock-Index Dow Jones (Industrial Average) give you a hint - BEFORE the final voting takes place on the 8th Nov. 2016? Zum 2. 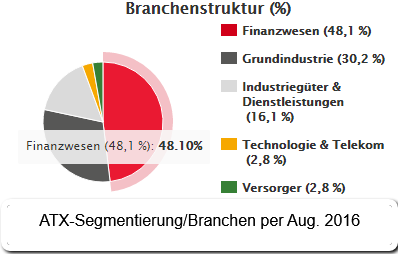 Mal in Folge ließ das Nachhaltigkeitsteam von EY Global in einer unabhängigen Umfrage institutionelle Investoren zu ihrem Interesse an nichtfinanziellen Unternehmensinformationen und zu deren Verwendung befragen. 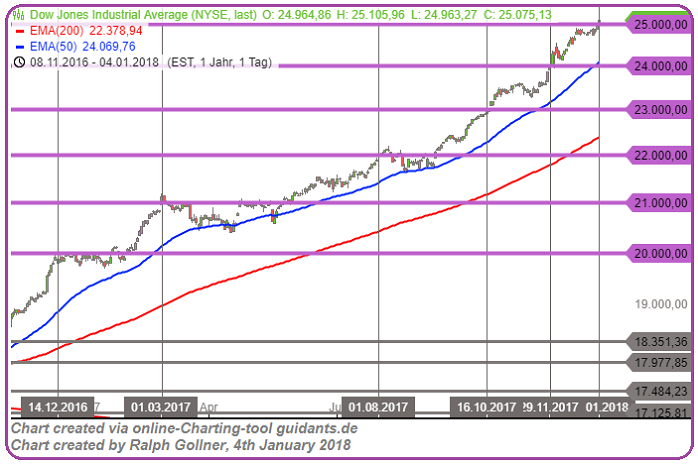 Entweder die 18.000 Punkte im Dow Jones halten, oder es sind auch 17.500 (recht rasch) möglich. Sollte auch dieses Niveau nicht gehalten werden, könnte der Pfad bis 26. Dez. 2016 auch anders ausgehen...(als grau eingezeichnet). Mit dem wichtigen Kursanstieg über die Jahreshochs aus 2015 bei 2.134 Punkten wurde per Tages-schluss in den letzten Tagen ein mustergültiges Kaufsignal aufgestellt (laut. 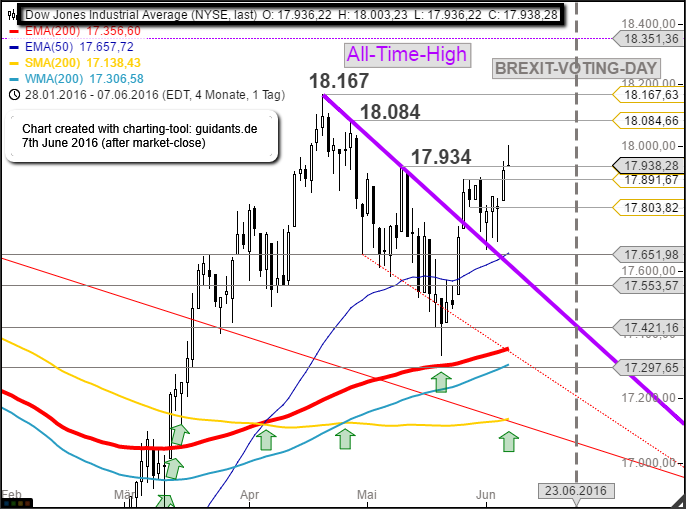 Theorie),..
"Polls may point to a BREMAIN-vote"
Das Referendum über den EU-Verbleib oder -Austritt Großbritanniens am Donnerstag (23. 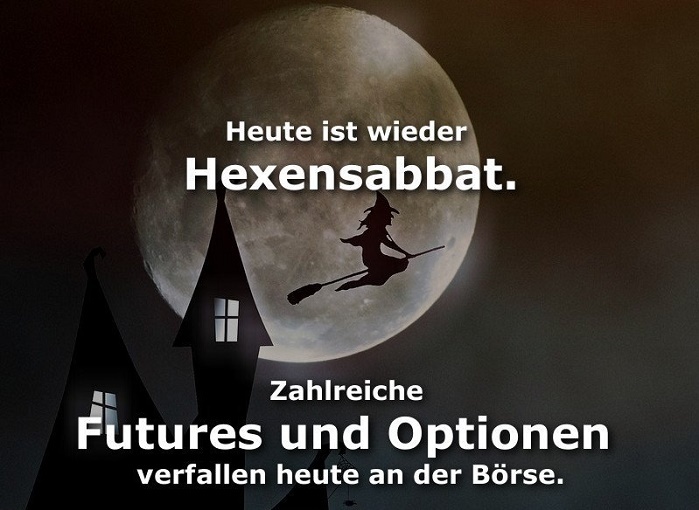 Juni) bleibt das alles beherrschende Thema an den Finanzmärkten. 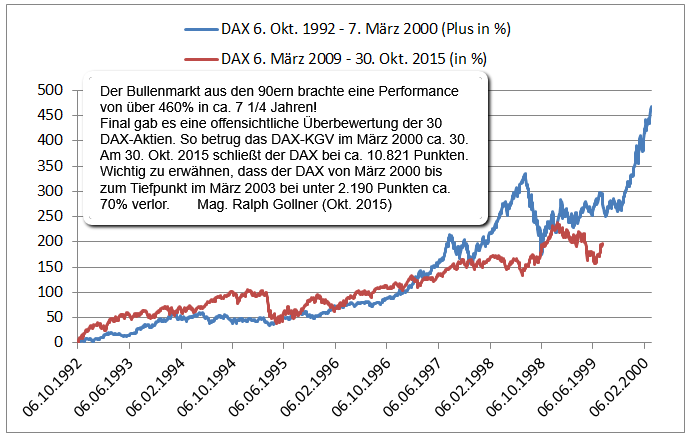 Schon seit Tagen (& Wochen) bestimmen die Umfragen über den Wahlausgang die Richtung an der Börse. 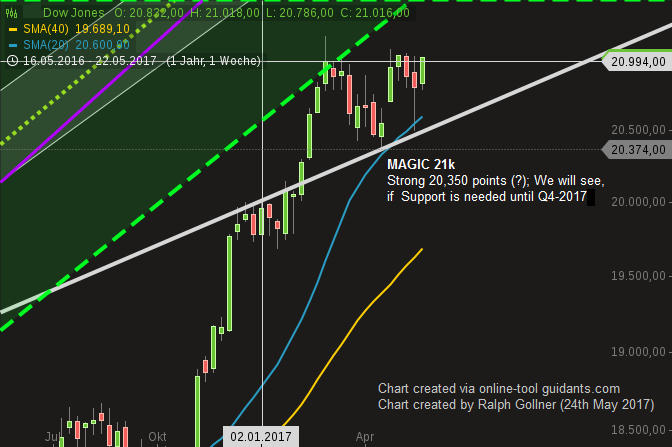 S&P 500 is trading around 2,100. 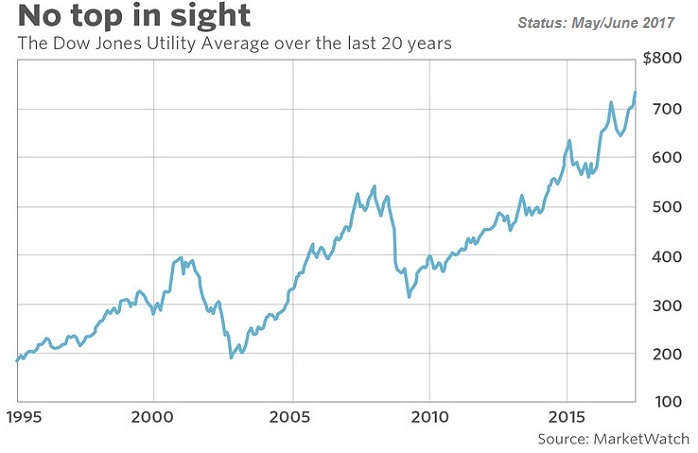 It has traded at that level numerous times in the last 20 months. 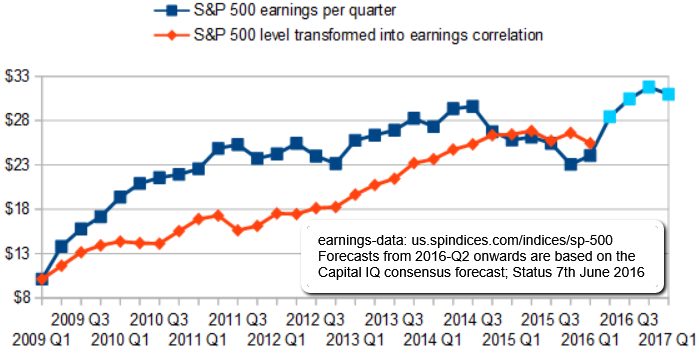 During that time actual quarterly earnings for the S&P 500 have plunged from its high (USD 29.6 in Q3/2014) quarter by quarter. 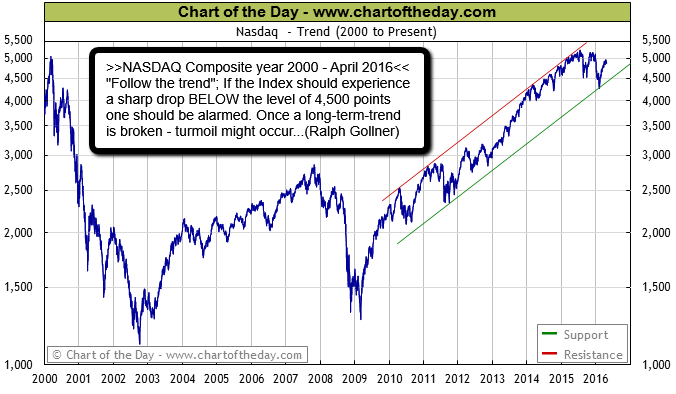 Since the year 2000, the Nasdaq Comp. 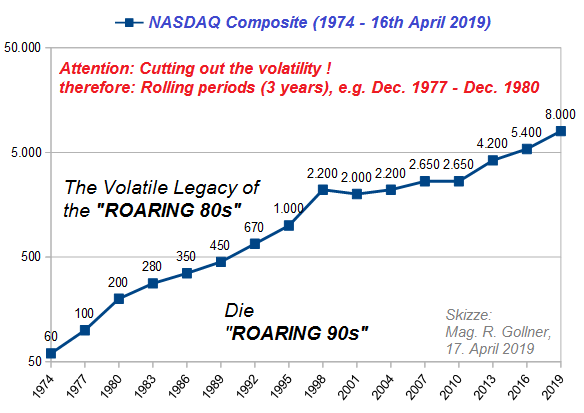 has traded in a very volatile fashion with two major bear markets (the dot-com bust and the financial crisis) along with two major bull markets (the credit bubble rally and post-financial crisis rally). Der schrittweise Anstieg ohne hitzige Euphorie seit Mitte April (2016) ist ein wirklich gutes Zeichen. Aber was versteht man genau unter "Euphorie" (H. Kutzer beschäftigt sich ja gerne mit Herkunft und Bedeutung von Worten)? 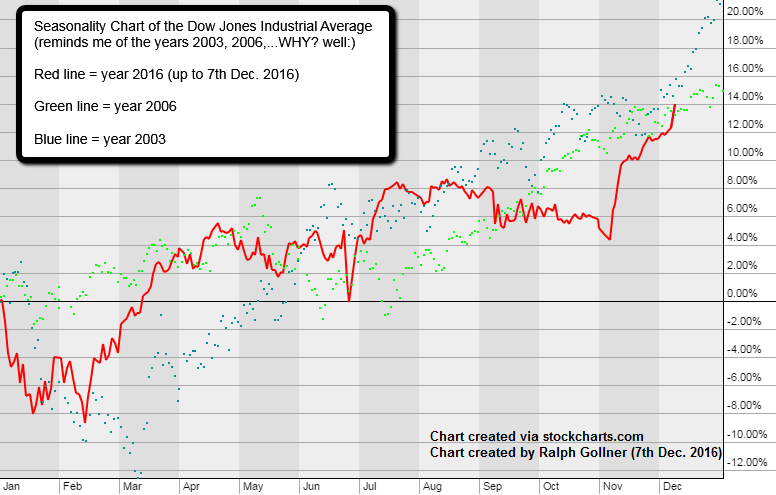 Between the year 2000 and now (April 2016) Dow Jones-Investors did not gain much. 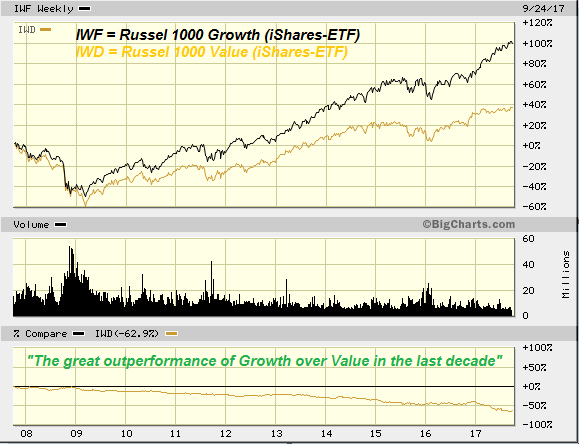 My personal opinion: The investors in the two decades BEFORE 2000 have taken gains from the future! 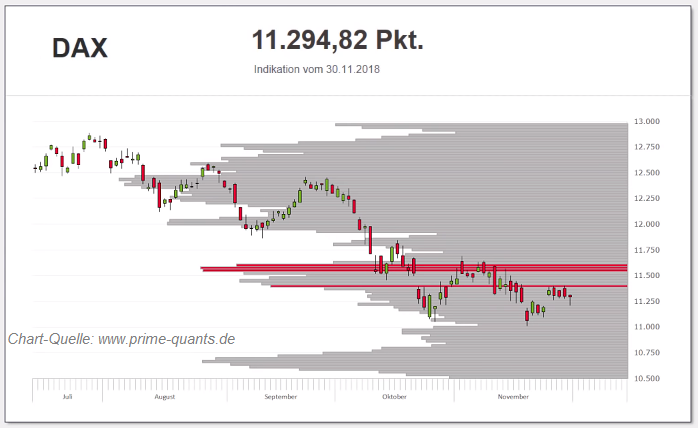 Das deutsche Aktienbarometer DAX notiert wieder UNTER 10.000 Punkten. Seit Dez. 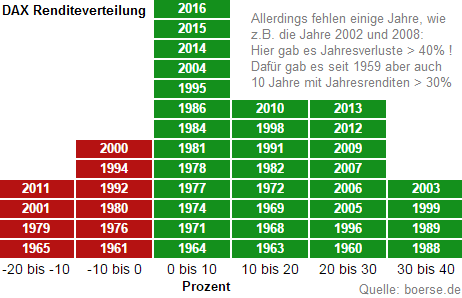 2015 hat es der Index per Wochenschluss nicht mehr über 10.000 Punkten geschafft. 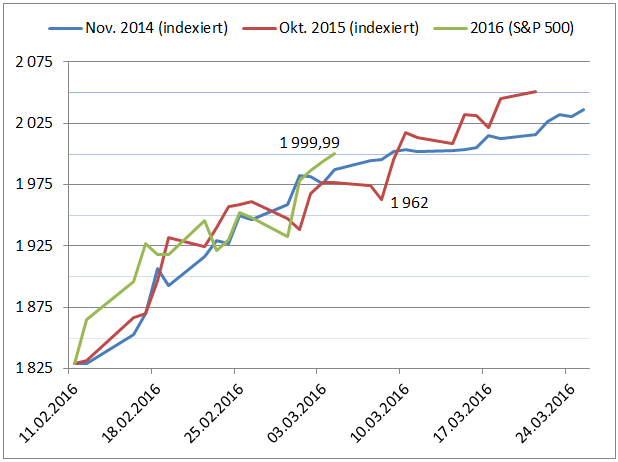 Slovakia’s tiny SAX index was up 6.4% in 2016 through 5th Feb. 2016, taking gains for the past 12 months to 36.6%. 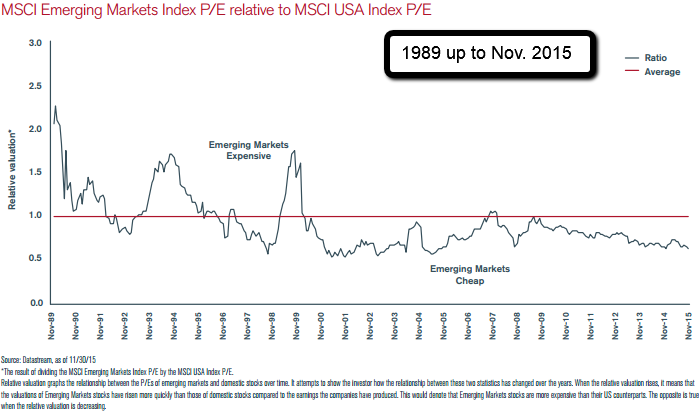 Valuations of EM equities are currently more attractive than they generally have been in the last two to three decades. 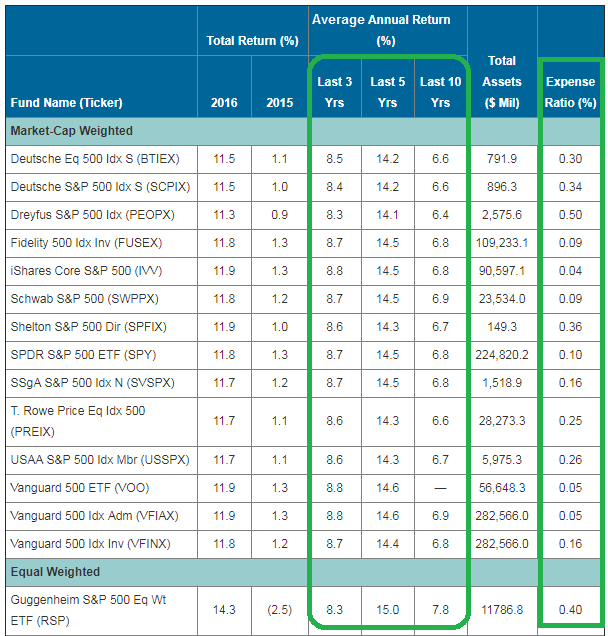 Looking back at the last 10 years, the average price-earnings ratio for these assets was around 10-11. 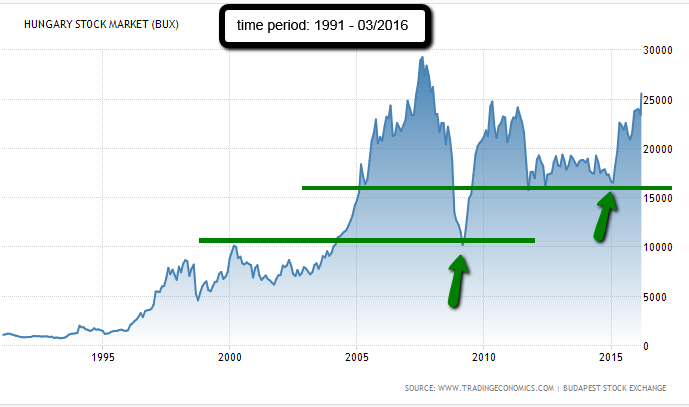 The Hungary BUX Index gained 6,808 points or 36.24 percent during the 12 months from 18,785 points in March of 2015. 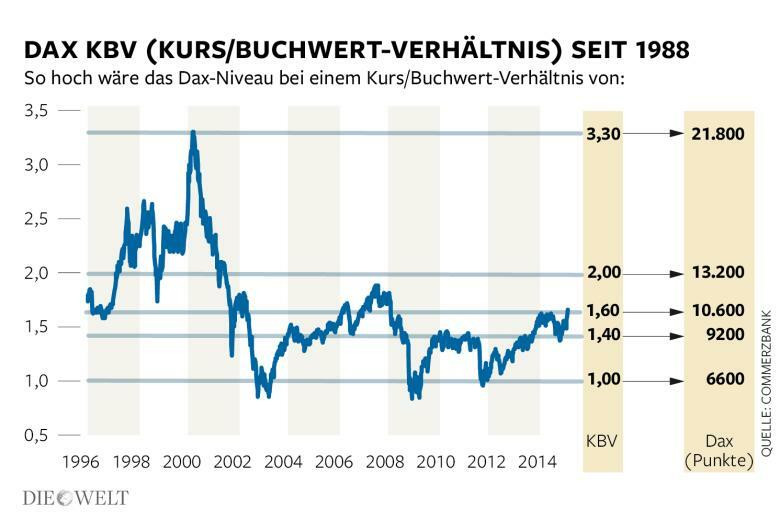 Historically, the Hungary Stock Market (BUX) reached an all time high of 30,118.12 in July of 2007. 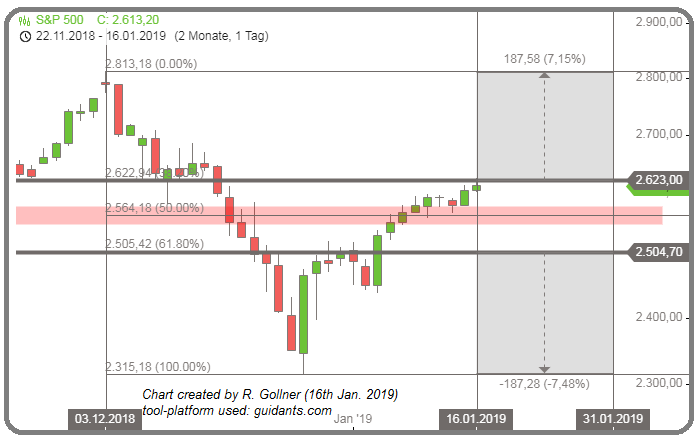 Over the 29 trading sessions from 29th December 2015 onwards until Thursday, 11th Feb. 2016 (Market-Close), the Dow has fallen more than 11%. 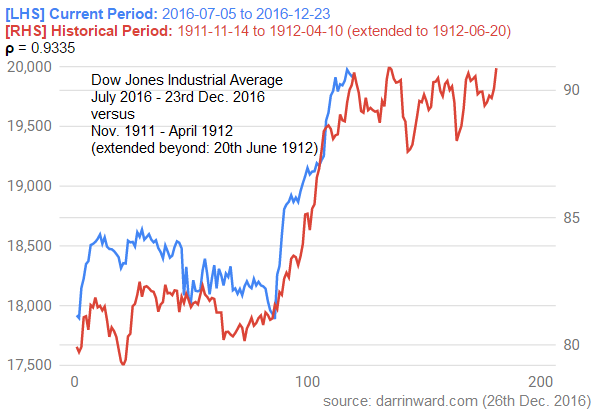 Mark Hulbert analyzed all data back to the late 1800s, when the Dow was created. 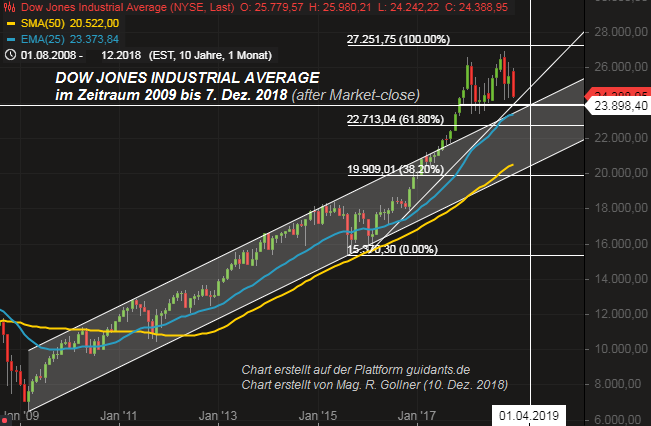 The Dow Jones Industrial Average managed to close above the psychological important level of 16k and above its 40-Monthly-Average in January 2016. 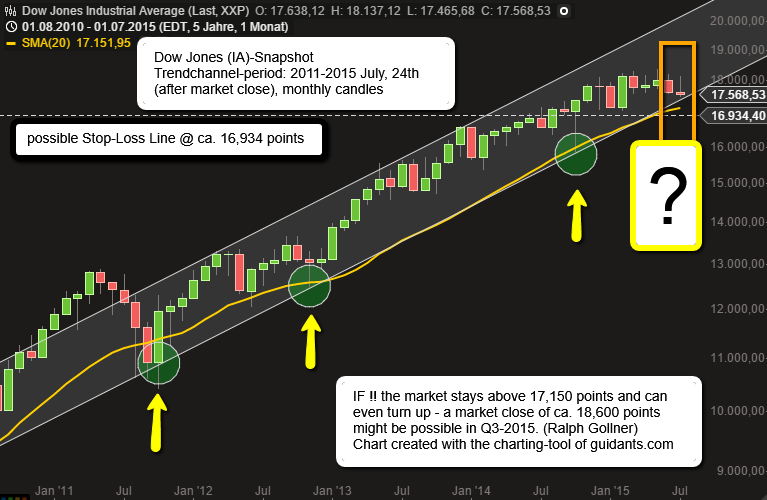 The monthly candlestick (Jan. 2016) looks somewhat ok, but still not perfectly bullish. 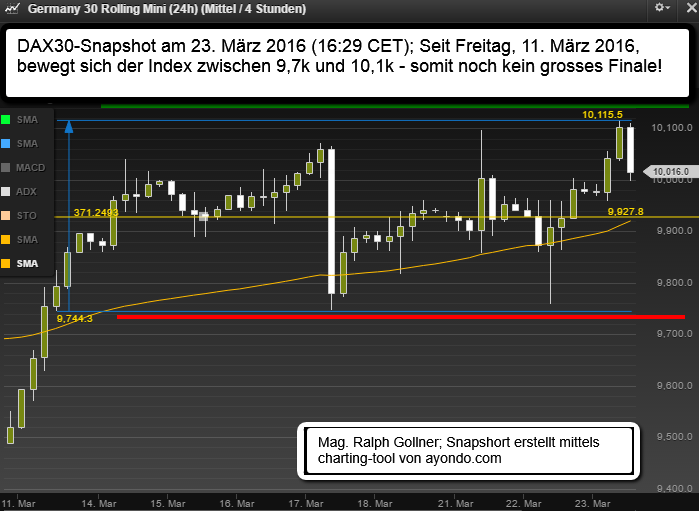 Turnaround-Thursday (nicht nur) im ATX Prime? 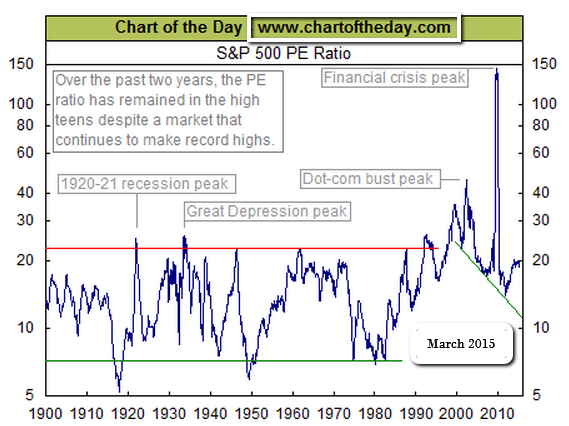 Fed Rate Increase: Will this Hurt Stocks in the medium-term? It's always good to know something about history. Whether it be of importance for your current actions, your future plans/strategy or not...(history may help you to understand complex situations). 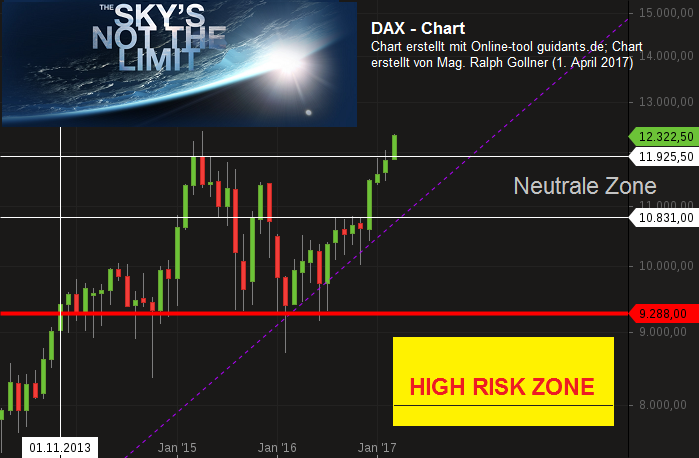 Das DAX-Jahr 2015 wird eingehen als extrem verwirrendes Wirrwarr, sowohl für Newbies, als auch (insbesondere) für alte Hasen; Dies lässt sich JETZT schon sagen. 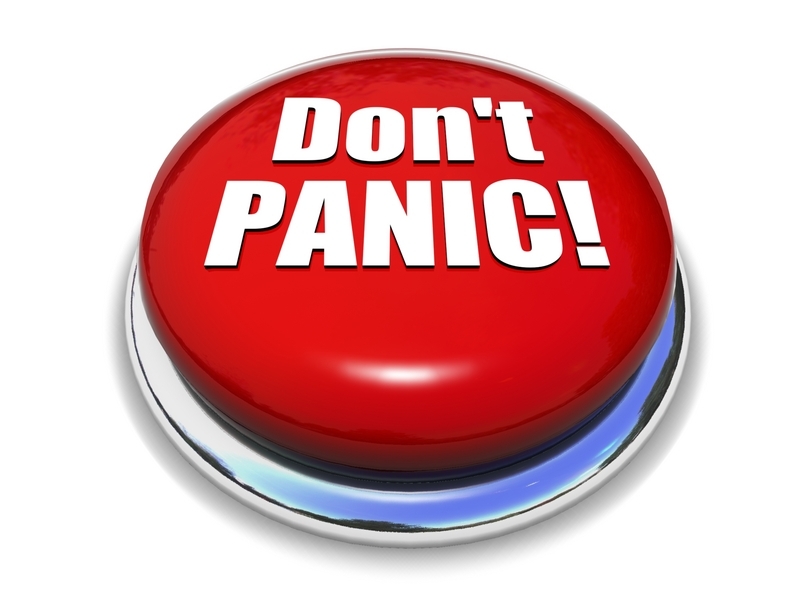 A possible Liftoff-action may take place on 16th Dec. 2015. That’s when the Federal Open Market Committee, the Fed policy-making group that sets the target rate, concludes its next two-day meeting. ♦ China became the world’s largest online retail market in 2013, when total sales reached $307 billion. ♦ By 2018, China’s ecommerce market is expected to be worth 871 billion euros. ♦ 871 billion euros will relate to an incredible 40% of the global eCommerce market. 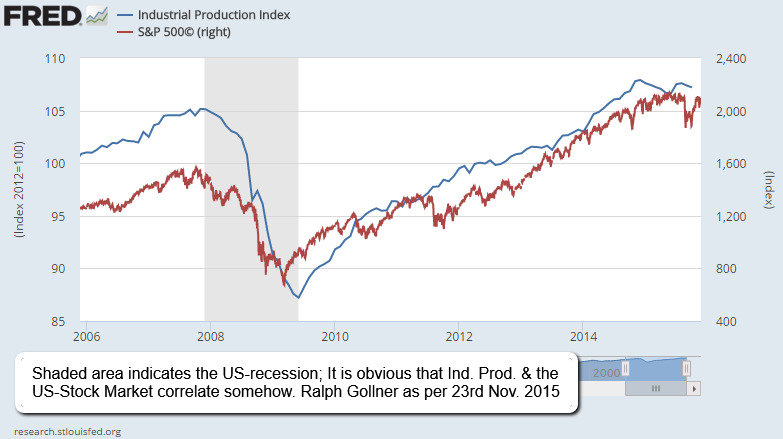 In the United States, industrial production measures the output of businesses integrated in industrial sector of the economy such as manufacturing, mining, and utilities (where the mining-sector is currently having tough times). 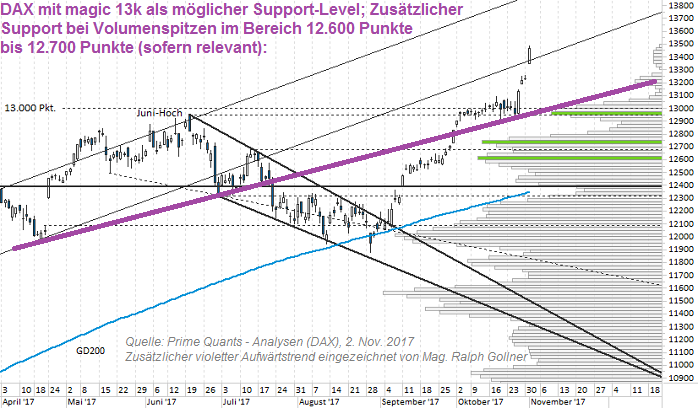 "Indiens Story geht gerade erst los"
Der DAX ist seit einigen Monaten wieder recht volatil unterwegs, markierte in diesem Jahr bei einem Level > 12.300 Punkten ein All-Time-High, sowie im Sommer bei einem Kursniveau von ca. 9.320 Punkten ein Jahrestief. Österreich ist bei der Aktionärsquote Schlusslicht, die Privatanleger laufen (wohl) in Scharen davon (? ), nicht zuletzt aufgrund einer im internationalen Vergleich höchst unfreundlichen Besteuerung, Stichwort „kein Verlustvortrag“. Everyone knows about the importance of a SMA 200. 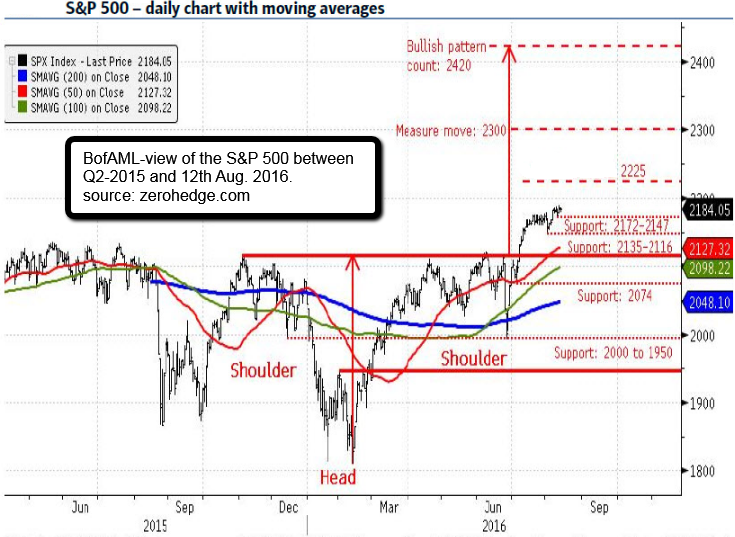 Moving Averages tend to give support or function as a resistance! 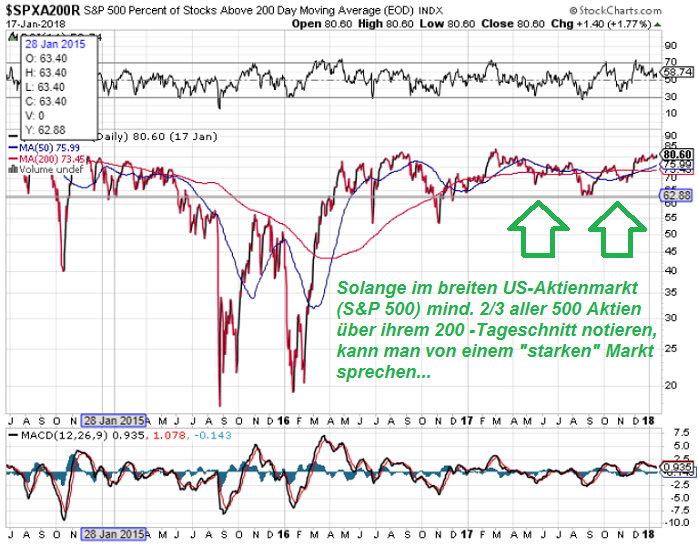 S&P 500 / neg. 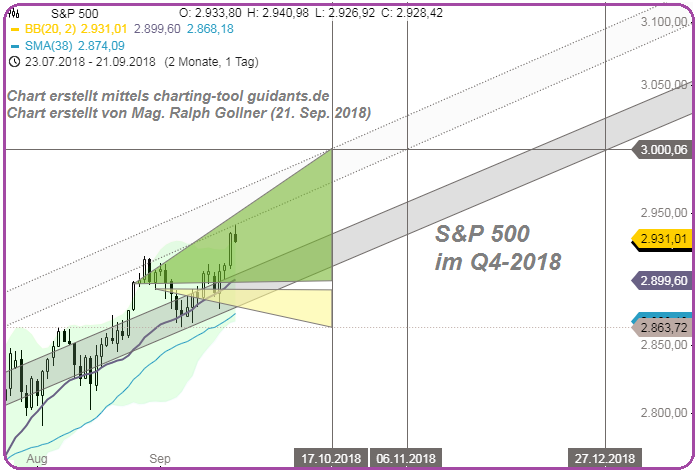 Aug. & Sep. - what follows next? 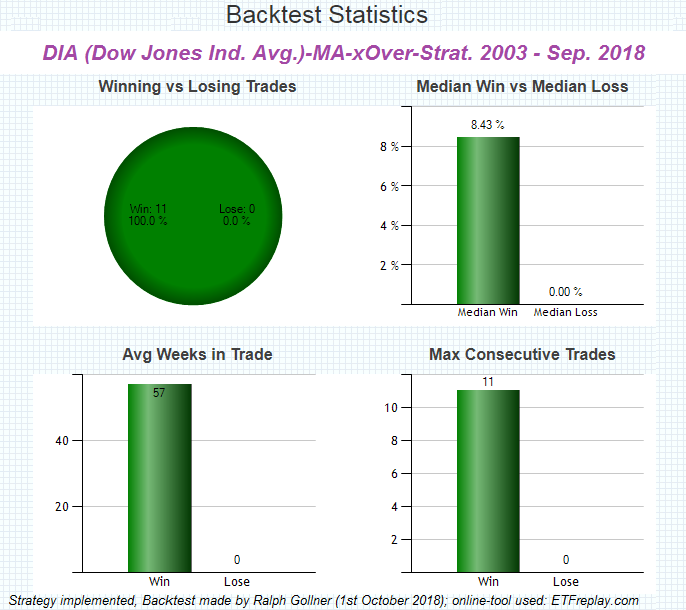 Following a research done by marketwatch with data from FactSet I rechecked a possible "redo" of Q1 1977 up to Q1 1978, which would lead to a 25% drop implying a Dow Jones (IA)-level of of between 13,100 and 14,000 points in Q1 2016. 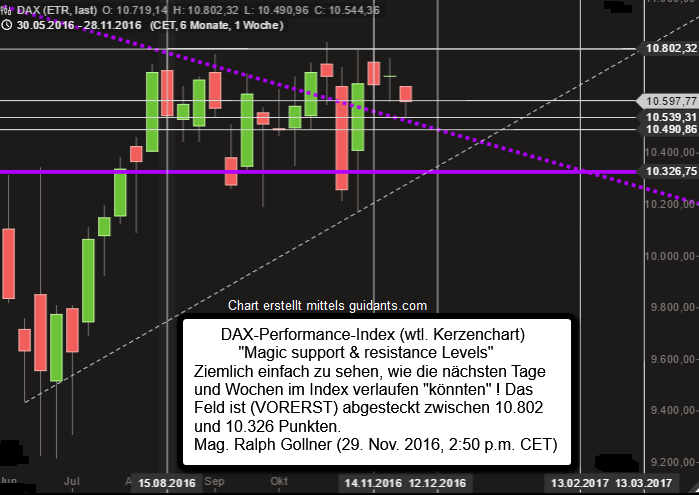 Folgend ein Langfristchart des DAX-Kursindex (nicht Perf.index). 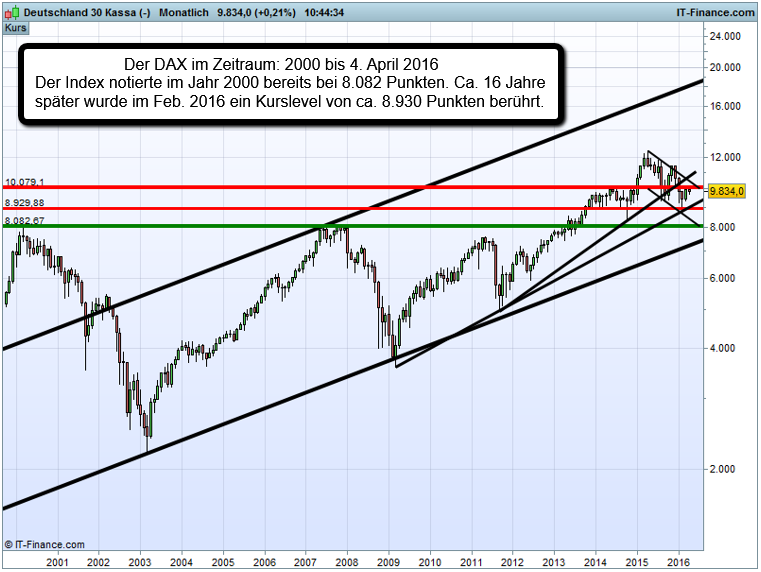 Man kann auch schön erkennen, dass im Jahr 2008 der DAX-Kursindex bereits > 5.000 Punkte notierte! Aktuell (24. 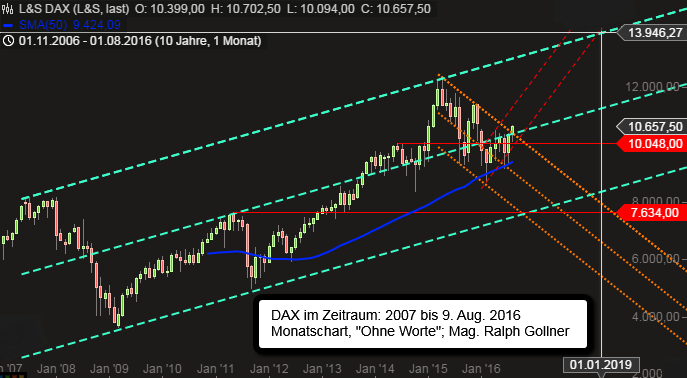 August 2015) befindet sich der DAX per Indikation CET 22:30 bei ca. 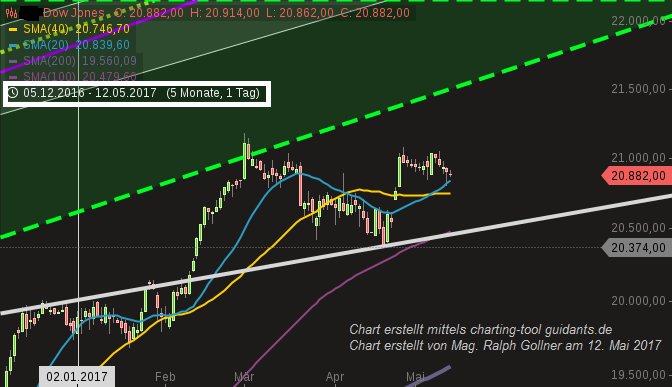 9.600 Punkten(L&S-Indikation)! 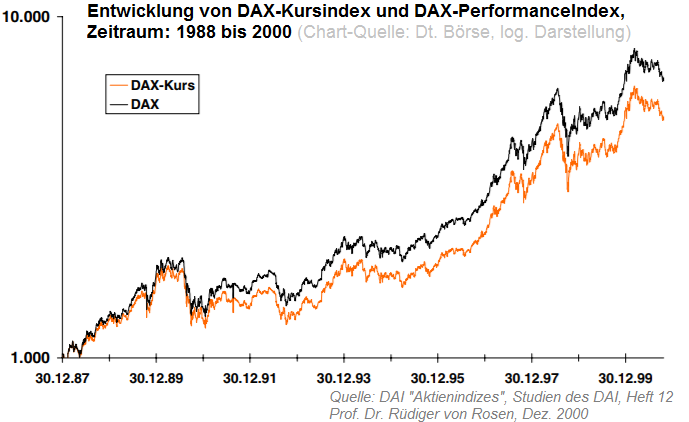 Rückblickend sollte auch erwähnt werden, dass 2014 ein klar unterdurchschnittliches Dax-Jahr war. 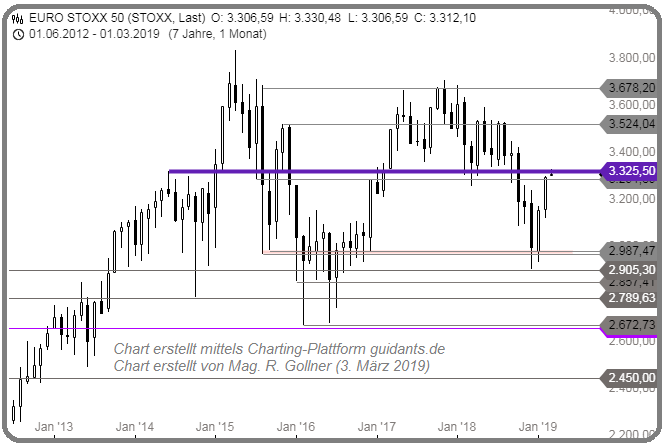 For this purpose I added the weekly SMAs for the following periods: 15, 30, 60 and 90. 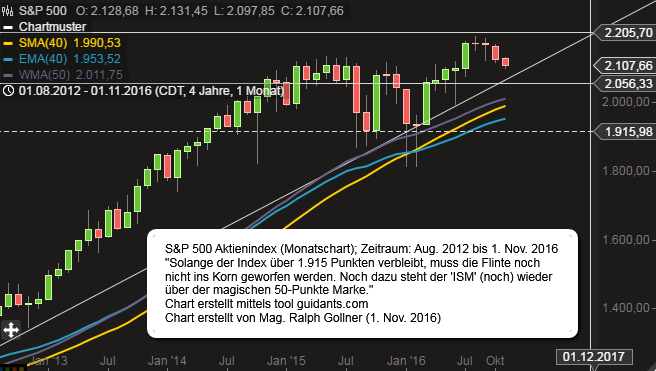 As per weekly close (closing as per Friday, 22nd Aug. 2015), the SPX closed little above 1,970 points with a long red candle. Das Kurs/Buchwert-Verhältnis (KBV) kündet davon, inwieweit der Aktienpreis durch den Wert aller Immobilien, Maschinen und Patente gedeckt ist. 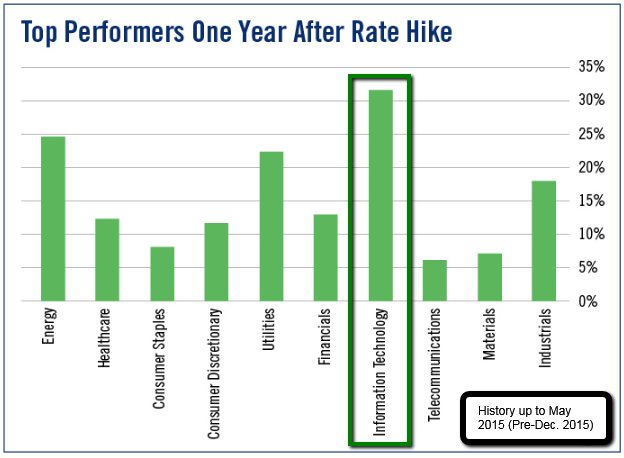 Taking a short step back and getting an overview about possible tactical allocations between asset-classes and sectors in the equities-universe it may be an idea to look further into the Tech- and Growth-Sector. The most important fact (in the medium/long-run) for rising company valuations are rising company earnings / which are (unfortunatelly) currently hardly growing (so far my input). 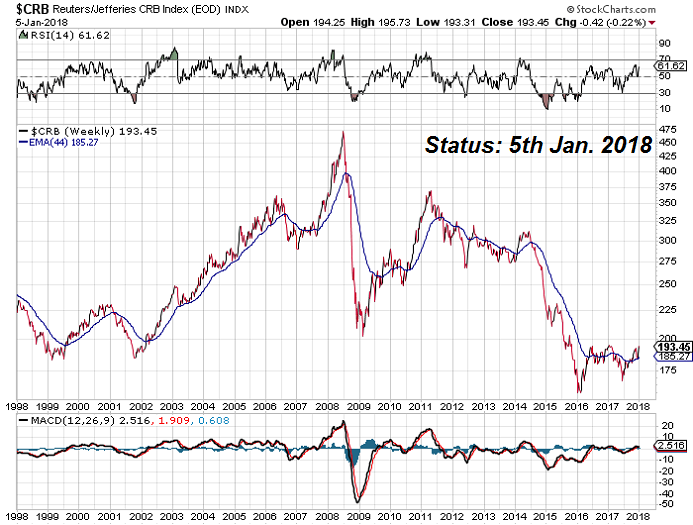 Following a chart of the Dow Jones U.S. Food & Beverage Index (DJUSFB) versus the Oil(& Gas)-Index (XOI). 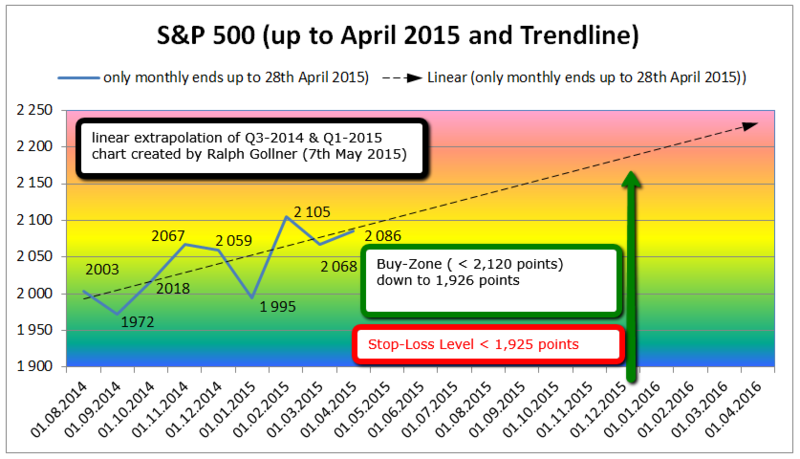 One can see the negative correlation which evolved since Q4-2014. 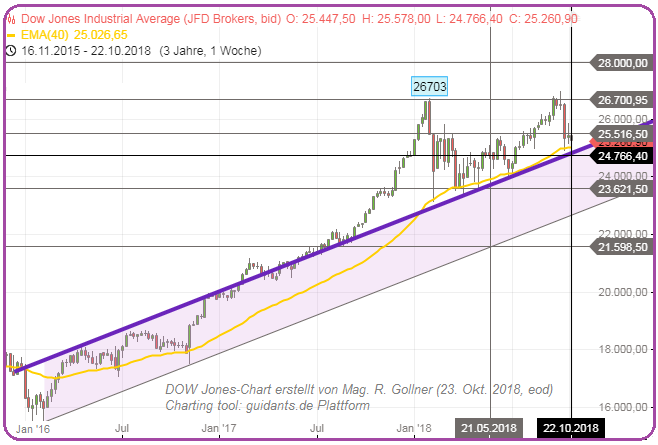 Below a trendchannel of the famous Dow Jones (DJIA) from the starting point 2011 (the last time some real turmoil was going on especially in the European financial markets) up to now, 24th July 2015. 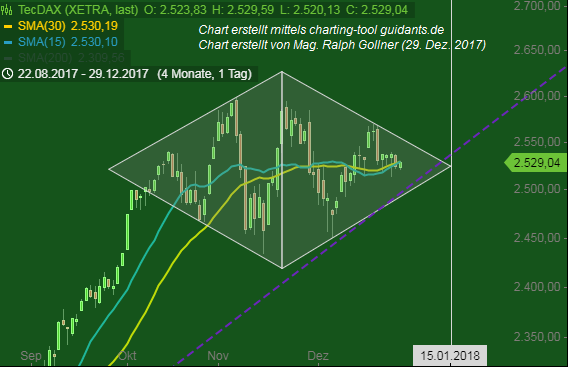 Wie bereits im Januar 2015 beim deutschen Aktienbarometer "DAX" gesehen, könnte auch beim amerikanischen S&P 500 bei einem (nachhaltigen) Verlassen des auslaufenden "Triangles" nach oben der "Deckel wegfliegen" (bei ca. 2.131 Punkten). There was a time, not so long ago, when it seemed the rugged promise of the globe’s economic frontier could be summed up with a simple acronym: BRIC. Die Flagge gehört zu den Konsolidierungsformationen. Dies bedeutet, dass es sich um eine kurz- bis mittelfristige Formation innerhalb eines intakten mittel- oder langfristigen Trends handelt. Dieser setzt sich nach Abschluss der Formation fort. Check out the smooth upfront-direction trigger SMA(28). 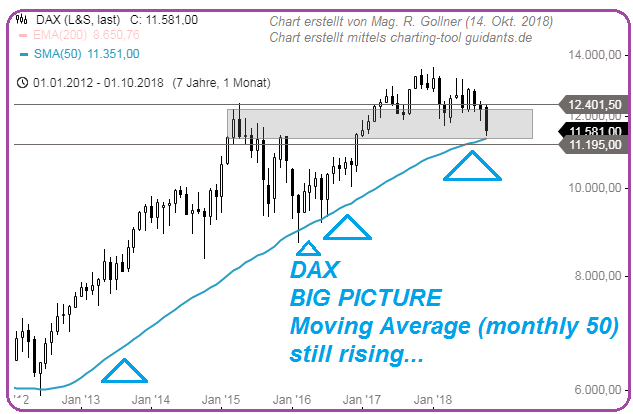 It is clear and obvious to see, that the patient DAX-Investor has a nice Trending Indicator (especially for TURNAROUNDS) in the German DAX-Performance-Index. 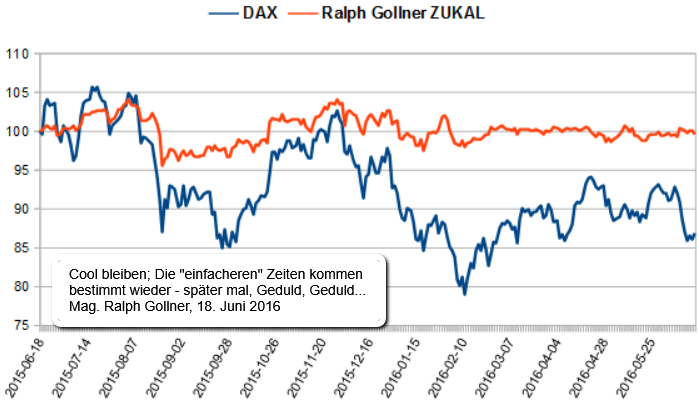 Der deutsche Technologie-index TecDAX zeigt in den ersten 5 Monaten des Jahres 2015 zunehmend relative Stärke gegenüber dem grossen Bruder DAX. 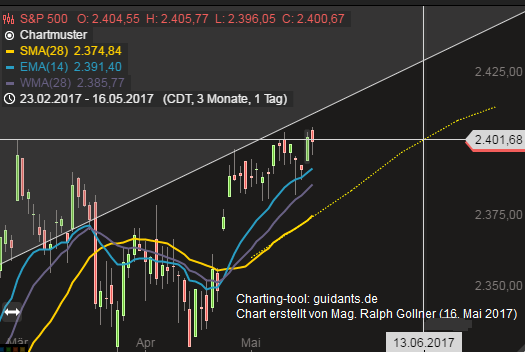 Anbei die möglichen Bandbreiten für einen positiven Chartverlauf im 2. 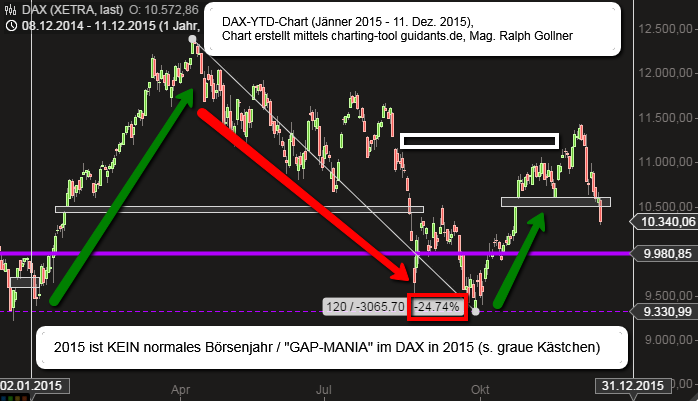 Halbjahr 2015. 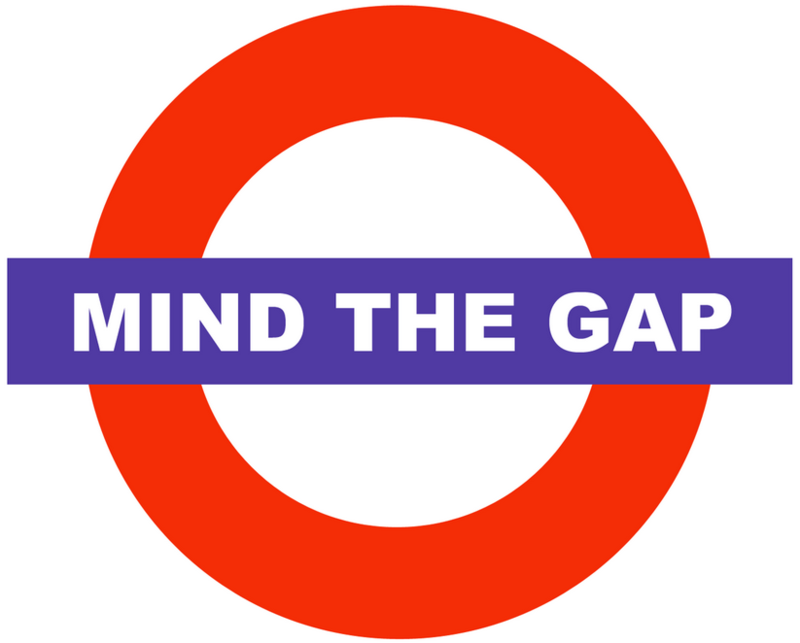 THE GAP HAS BEEN CLOSED ! 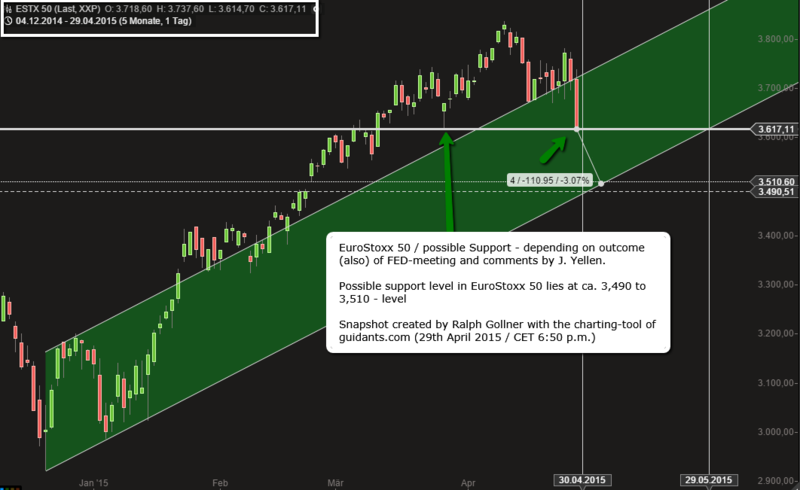 NASDAQ 100 risk @ 4,409 points - 4,3% ?? 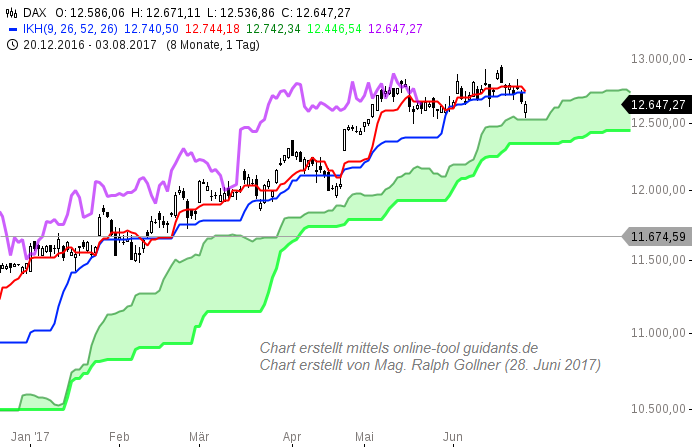 Intraday the well-known Bellweather-names Microsoft, Starbucks, Google are posting big intraday-gains. 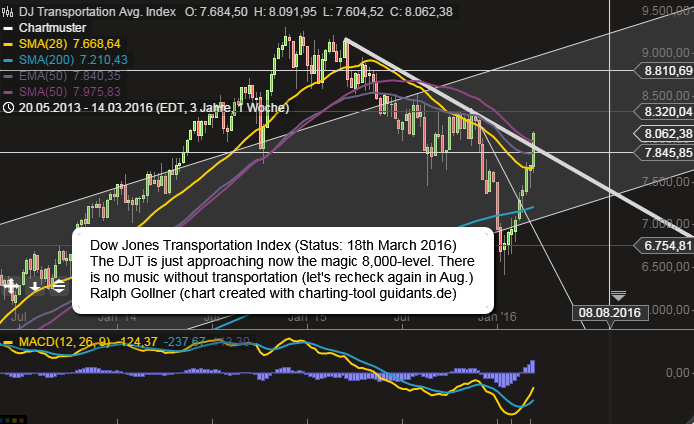 Danger ahead in the Dow Jones Transportation Index? 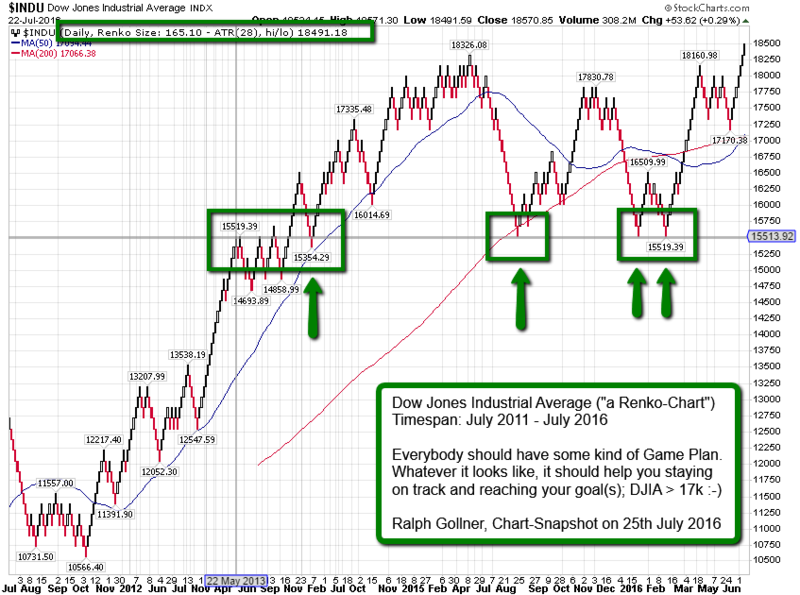 check out also the famous "Dow Theory"
If the DJT should fall below its SMA50-weekly => This should make us very cautious !! !